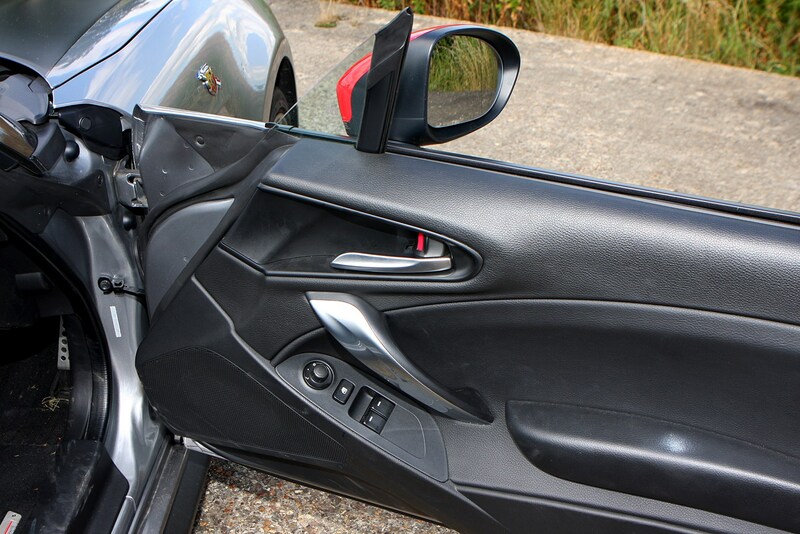 Insurance group: 29 - 31 How much is it to insure? 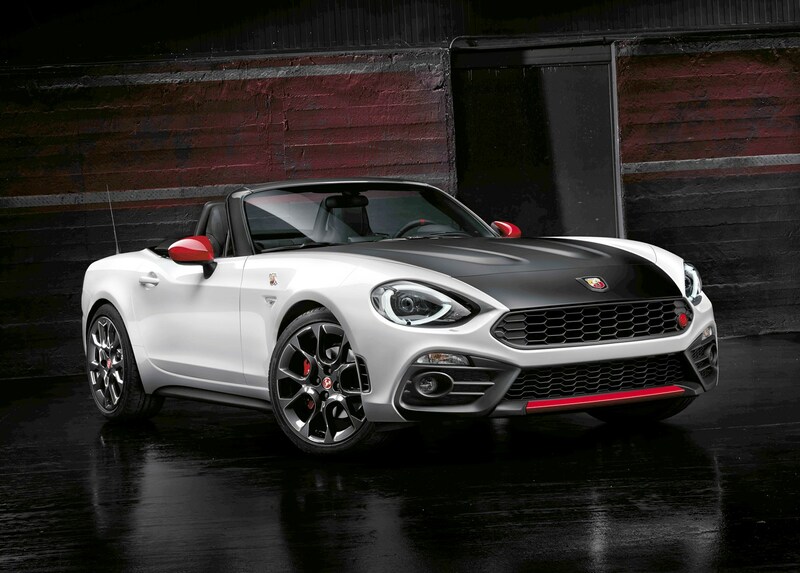 The Abarth 124 Spider is a two-seat convertible based heavily on the Fiat 124 Spider. 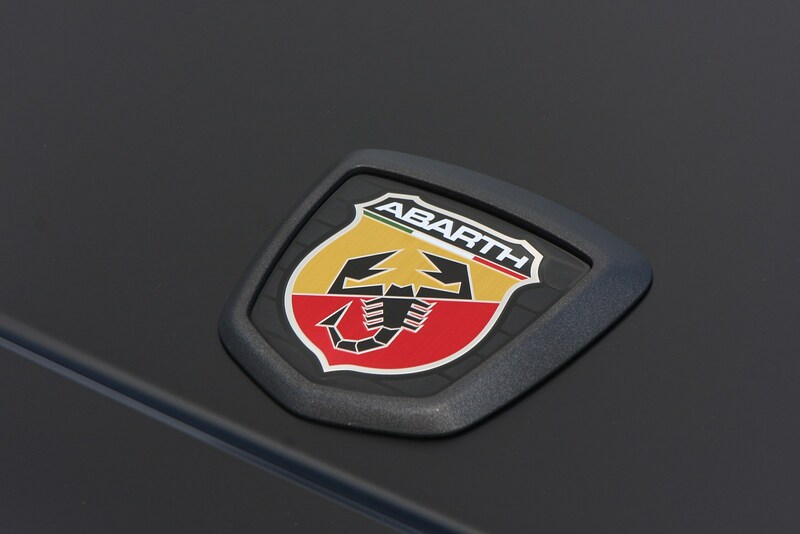 This is because Abarth is Fiat’s official performance division, responsible for creating faster, more driver-focused versions of existing Fiat products. 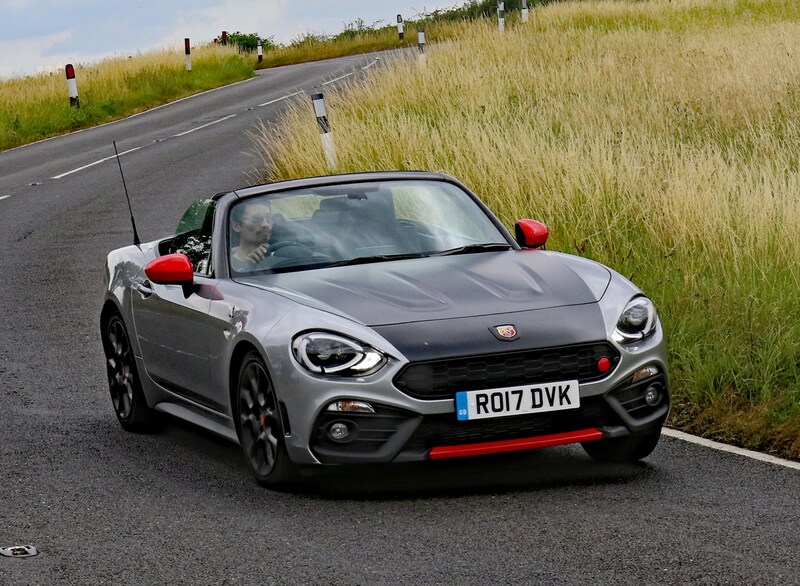 As such, the Abarth 124 Spider boasts more power and upgraded chassis components over its Fiat family member, not to mention a few choice visual tweaks inside and out. 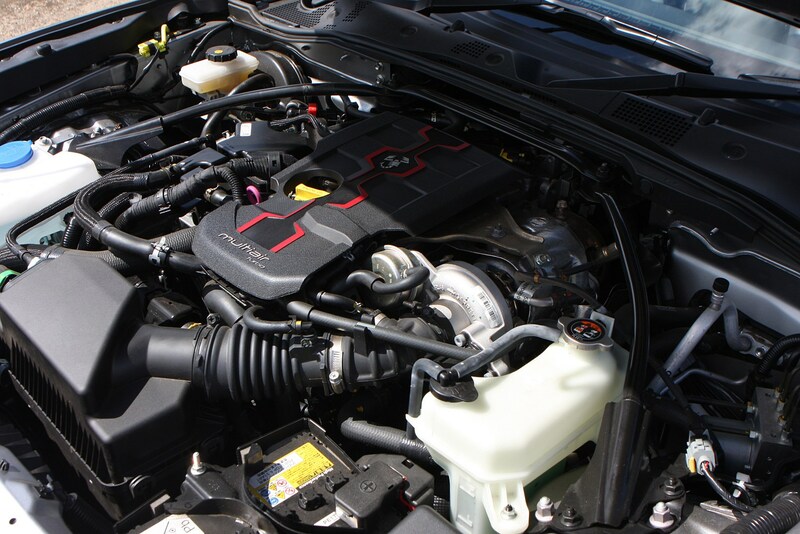 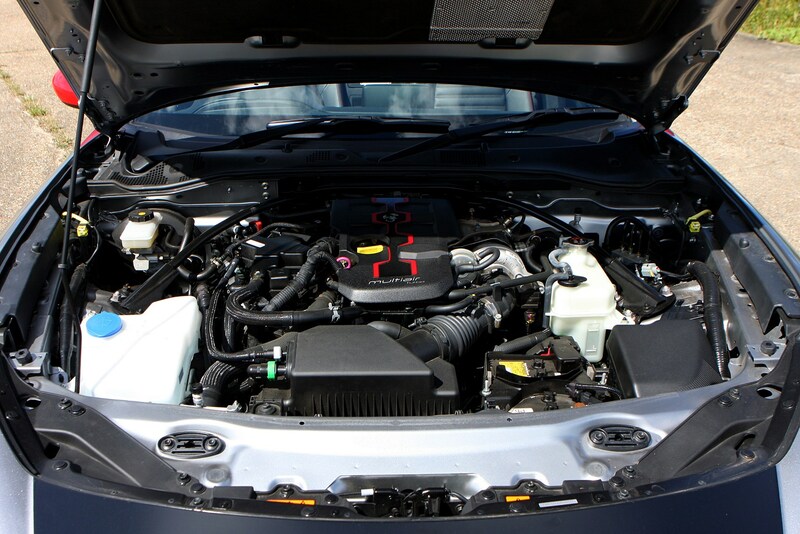 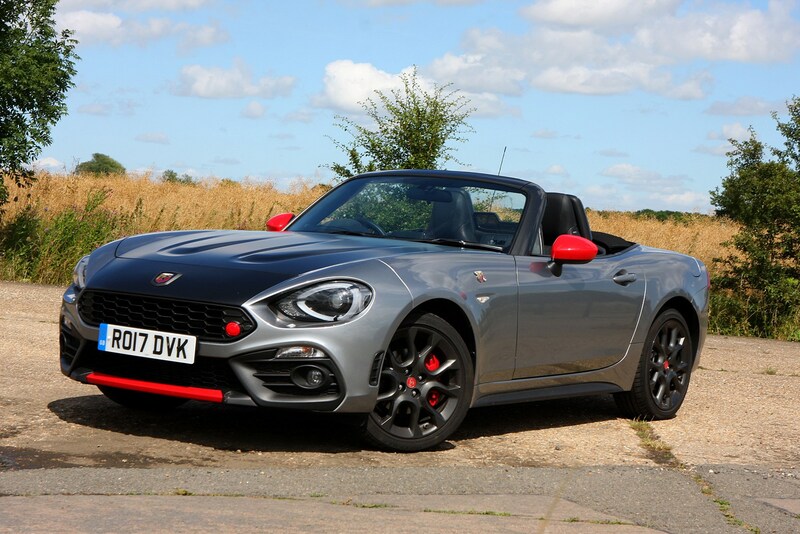 With the extra performance however comes extra cost, and as such the Abarth has some serious competition from the likes of the Audi TT Roadster and Toyota GT86, not to mention the popular Mazda MX-5. 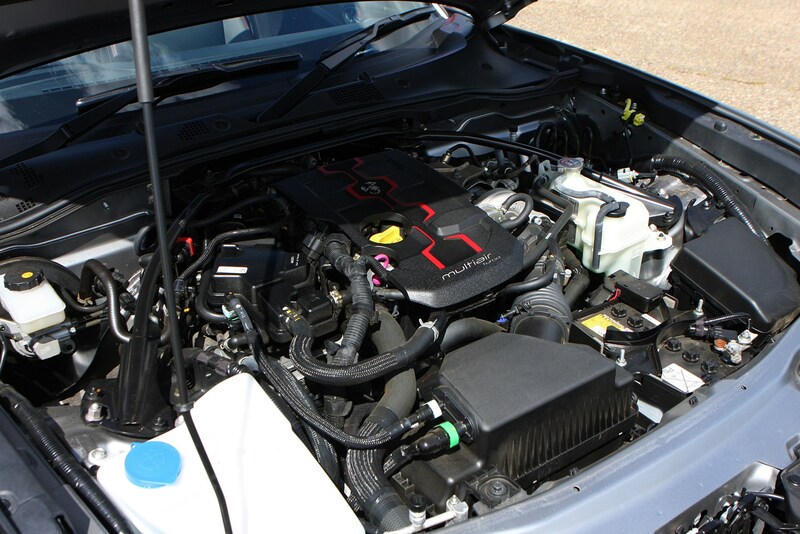 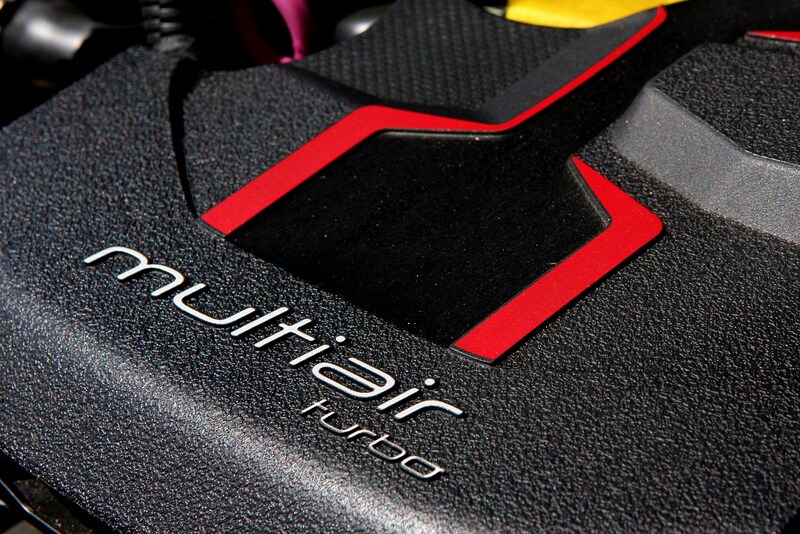 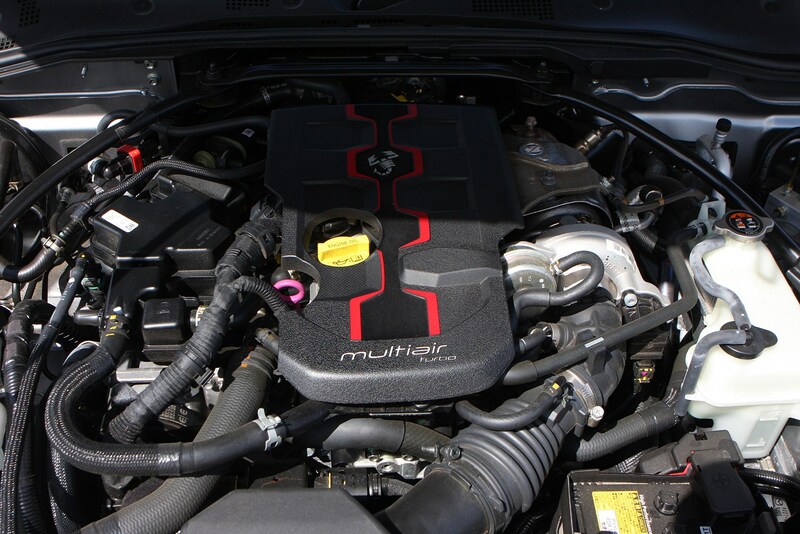 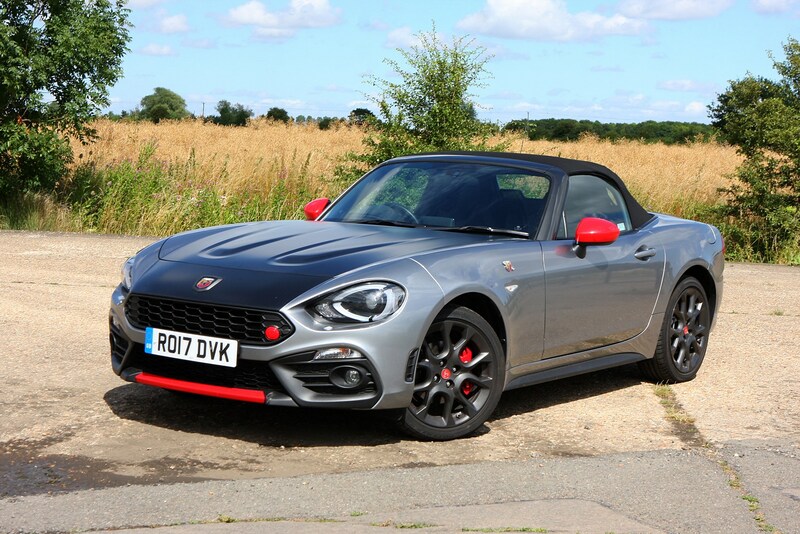 Compared with the Fiat 124 Spider’s (entirely respectable) 140hp output, the Abarth manages to squeeze out an extra 30hp and 10Nm of torque from the 1.4-litre turbocharged Multiair engine under the bonnet. 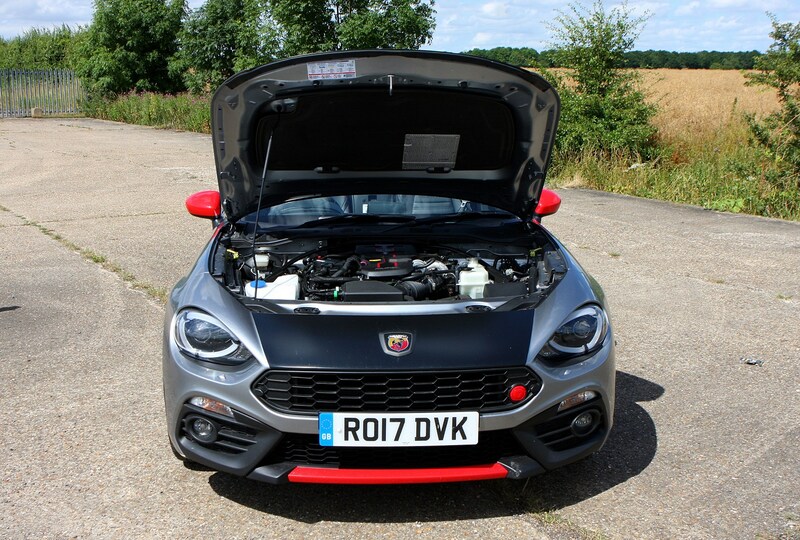 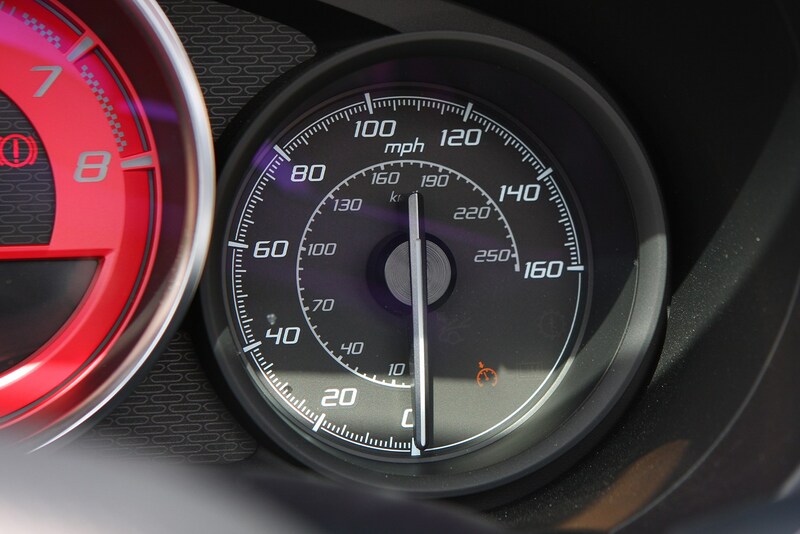 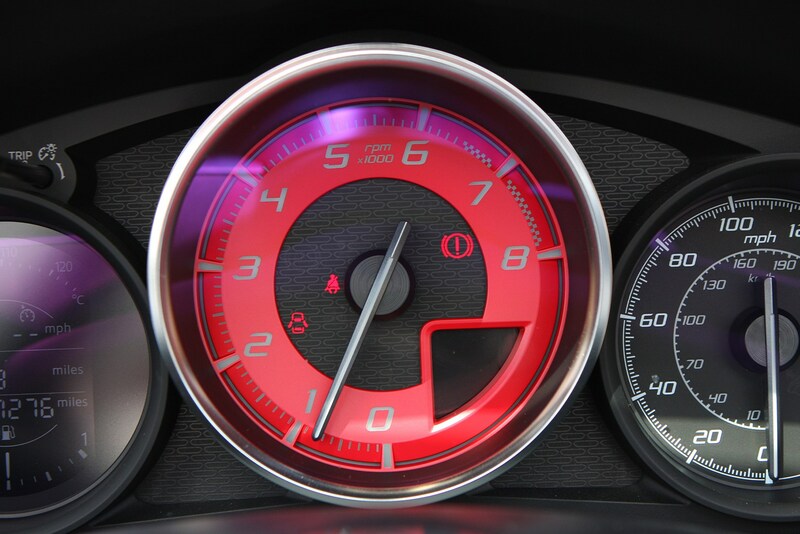 As a result, the Abarth is capable of accelerating from 0-62mph in 6.8 seconds (6.9 for the auto), and onto a top speed of 144mph (142 for the auto). 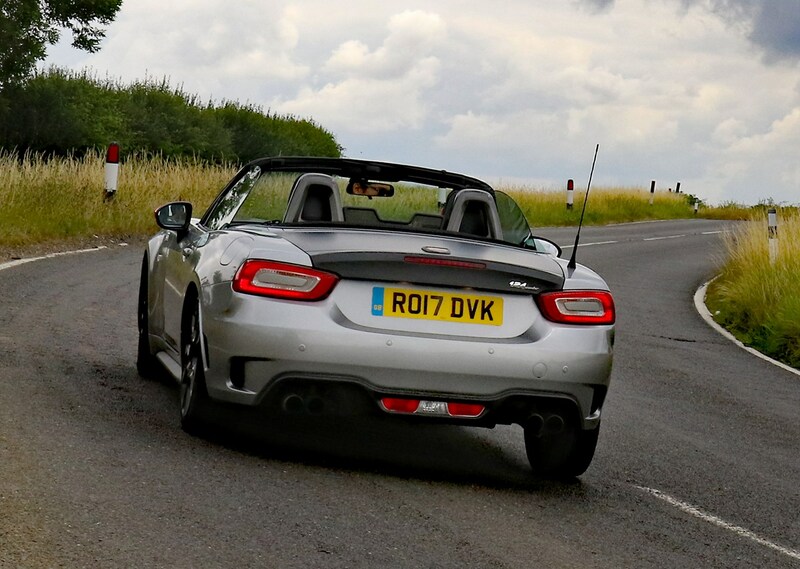 You can notice the extra oomph, too, especially with the standard-fit dual mode Record Monza exhaust burbling and crackling as you rifle through the gears. 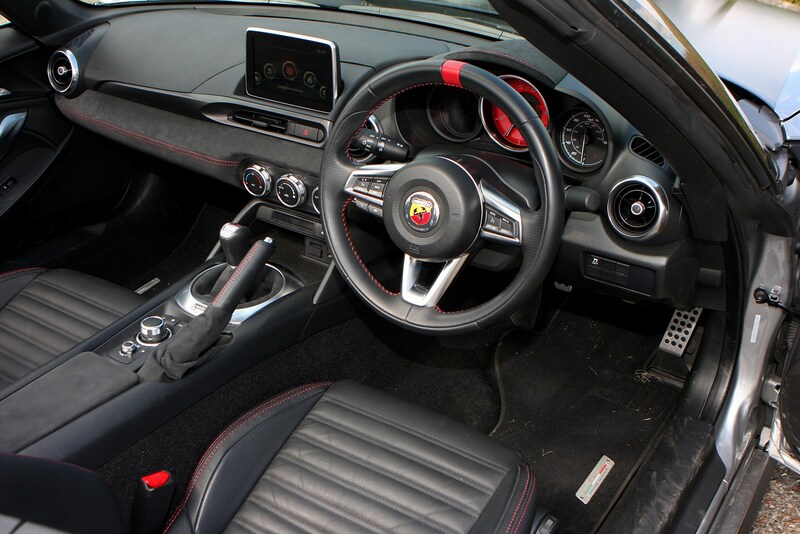 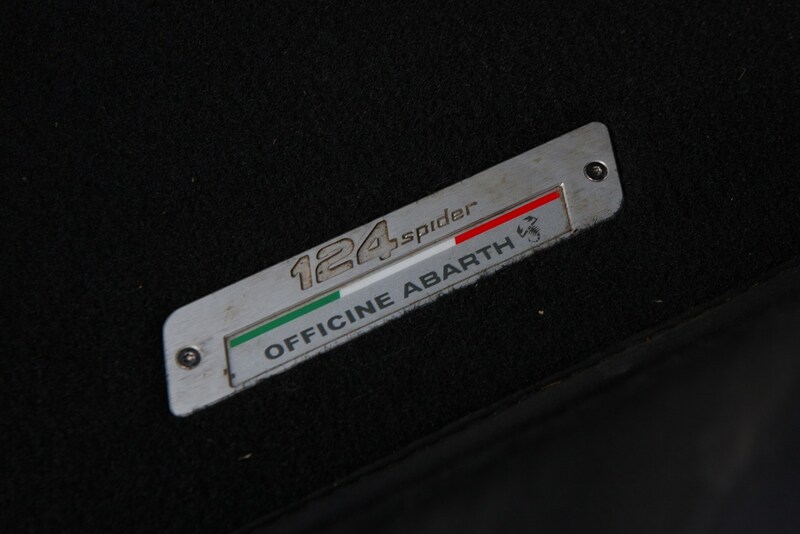 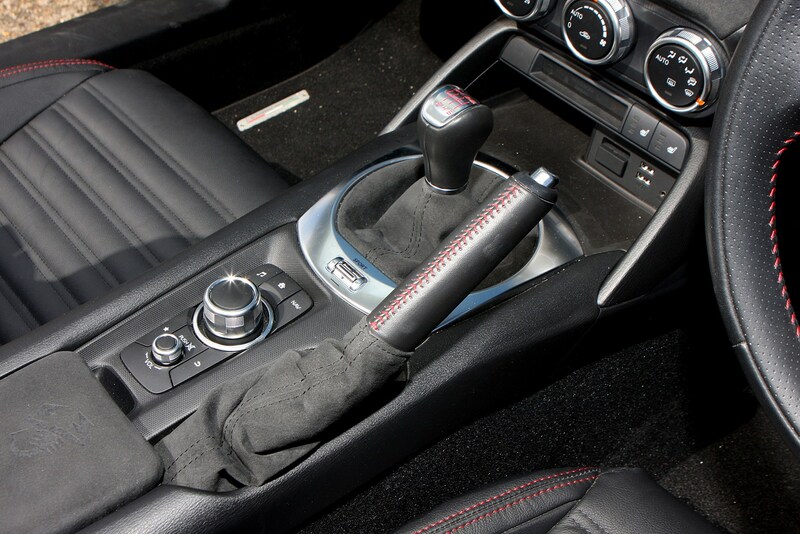 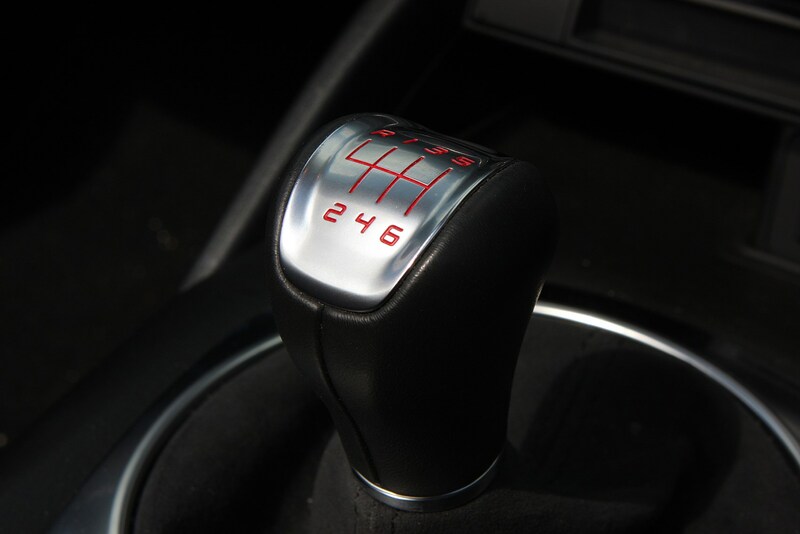 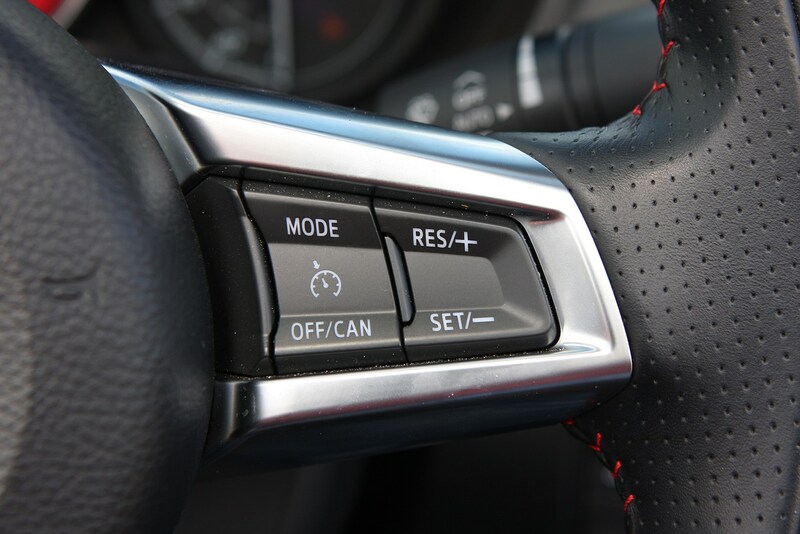 As with the Fiat 124 Spider, the Abarth comes with a choice of six-speed manual or six-speed automatic transmissions. 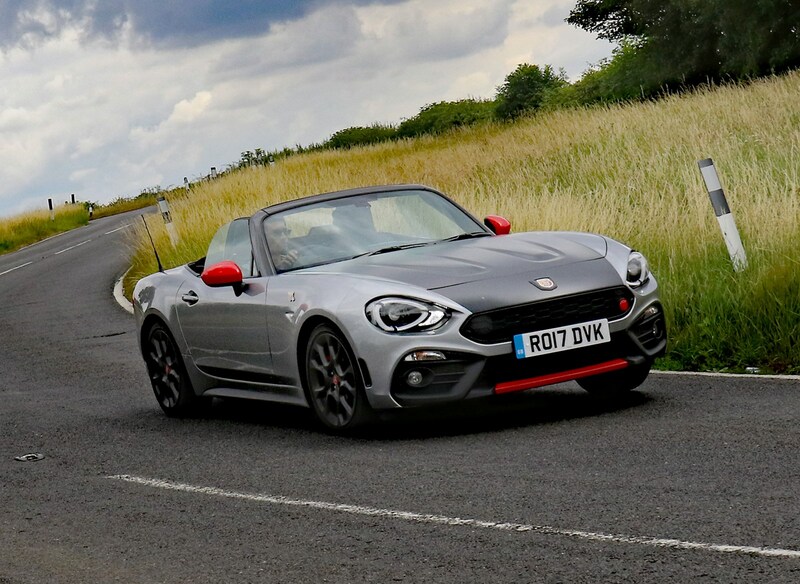 Despite being a dedicated open-top sports car with lithe, nimble handling and a mischievous sense of fun, the Abarth 124 Spider boasts surprisingly civilised road manners. 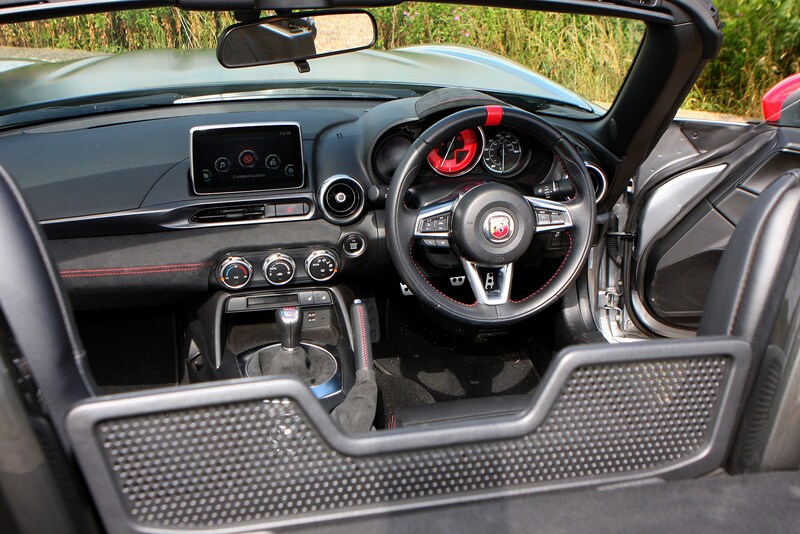 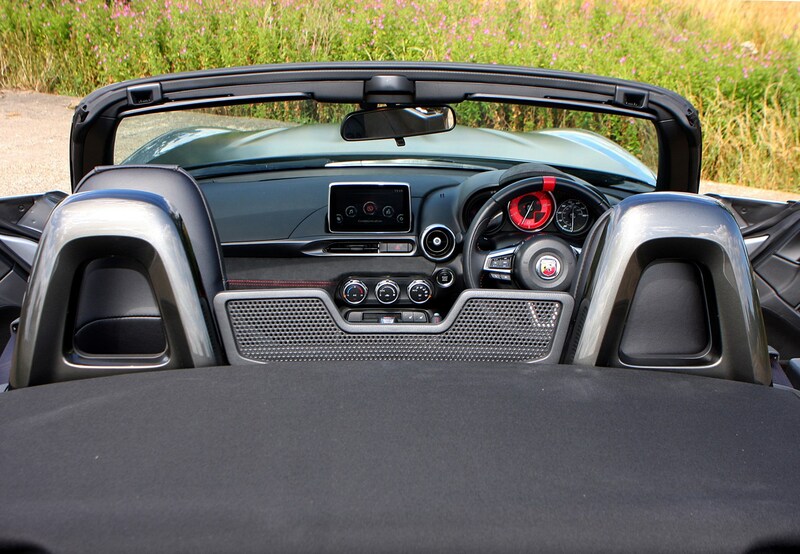 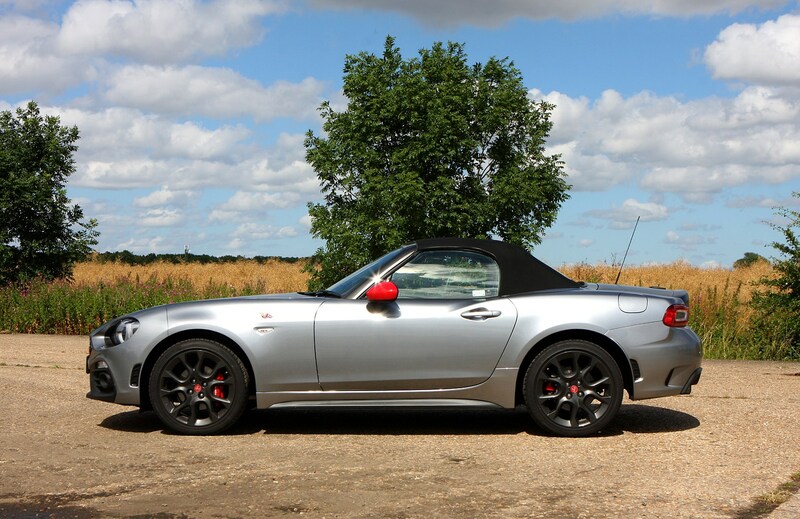 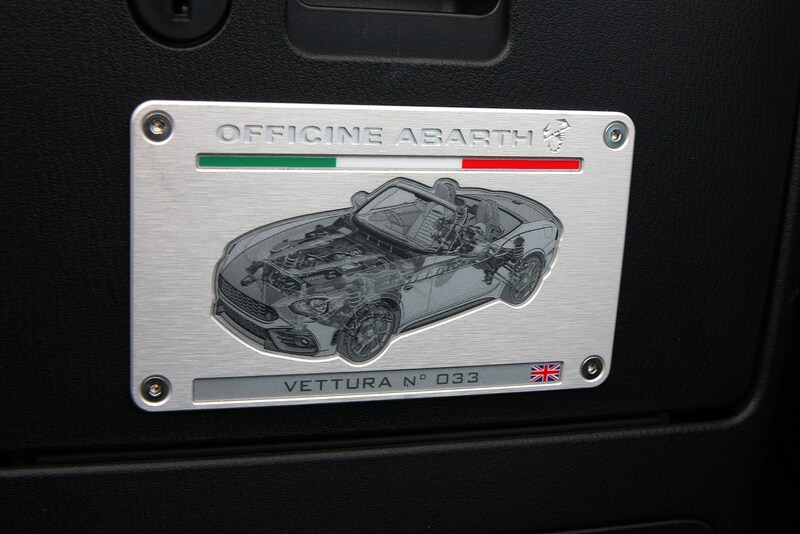 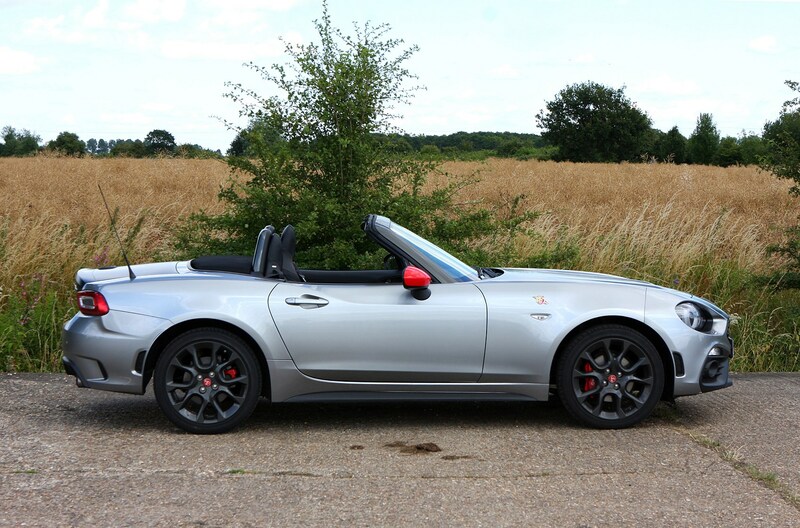 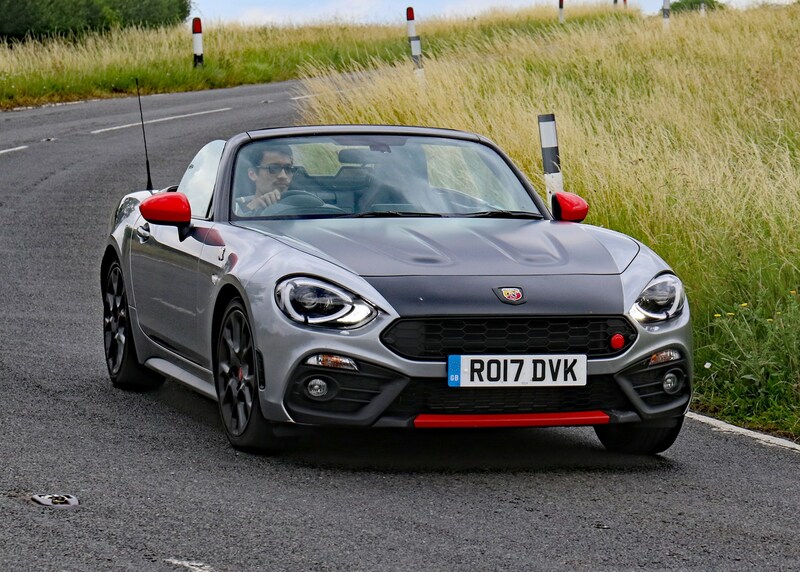 The 124 Spider’s levels of road and wind noise are incredibly noticeable, but the ride quality is extremely well-judged and, while firm, manages to retain a flexibility that makes the Abarth a perfectly usable everyday machine. 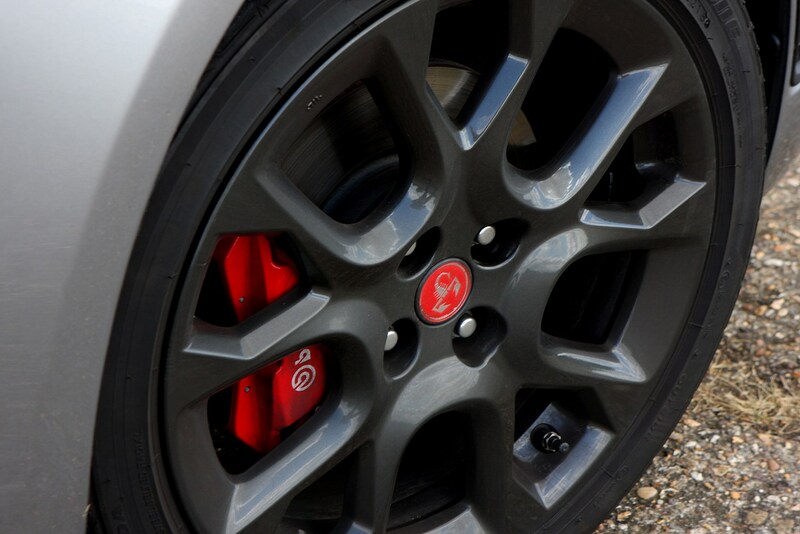 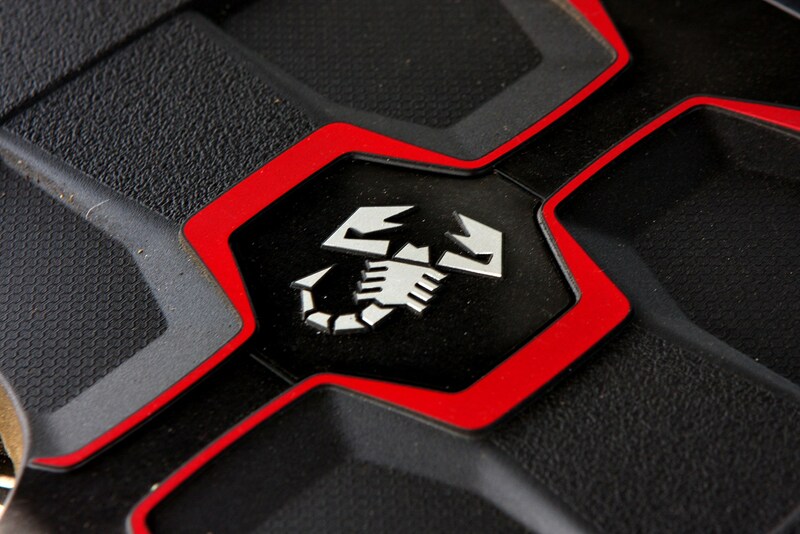 To help with stopping, Spider and Spider Heritage versions both come with standard-fit Brembo front brake calipers. 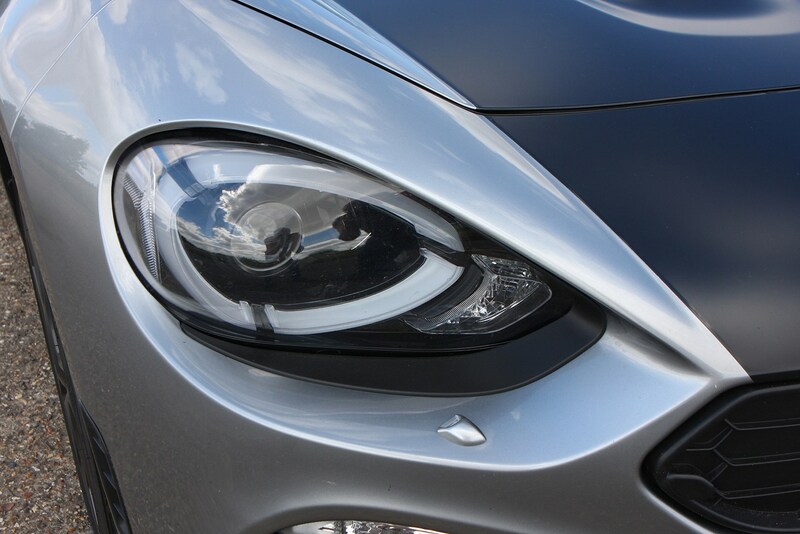 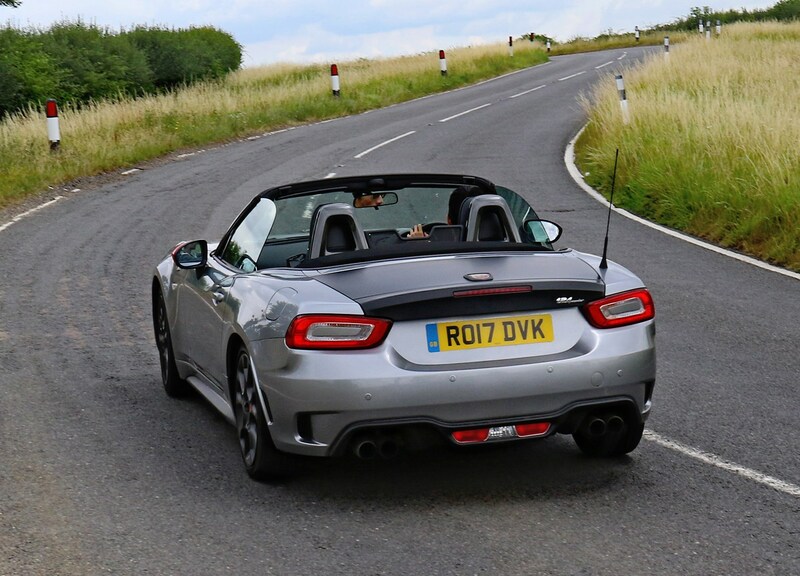 The 124 Spider isn’t going to win any awards for its on-board gadgets, yet there’s just enough standard equipment on all versions to keep the majority of drivers happy. 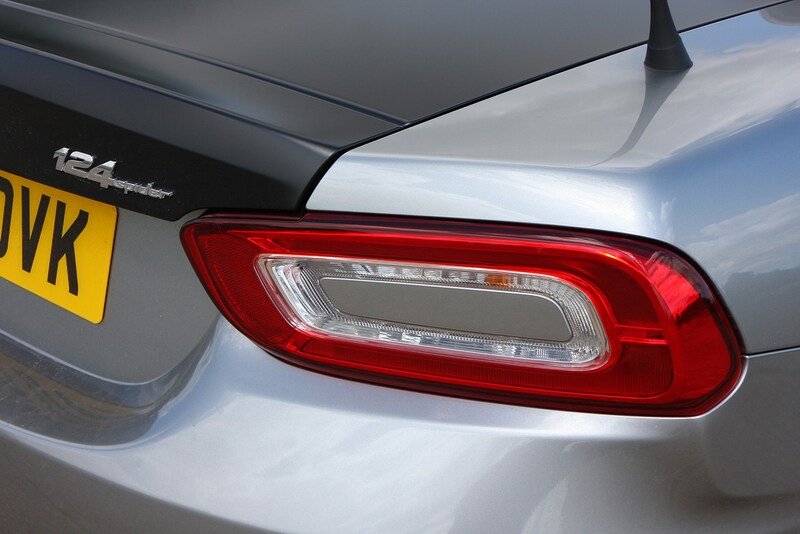 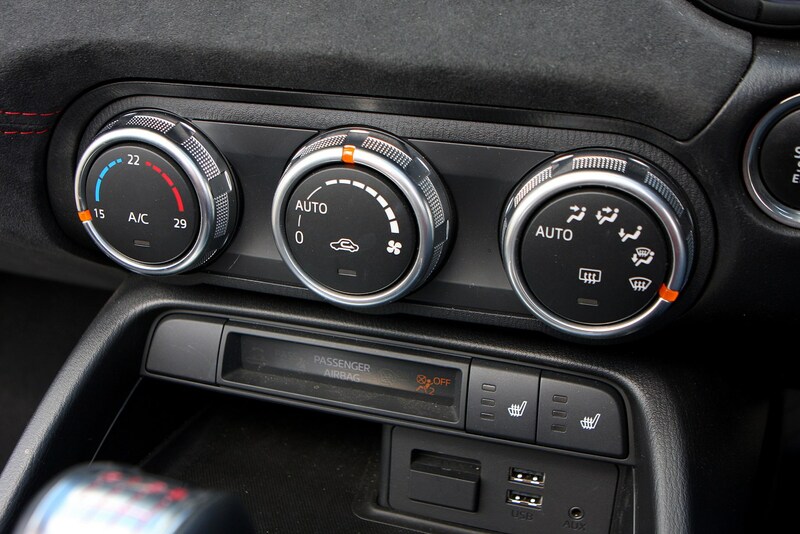 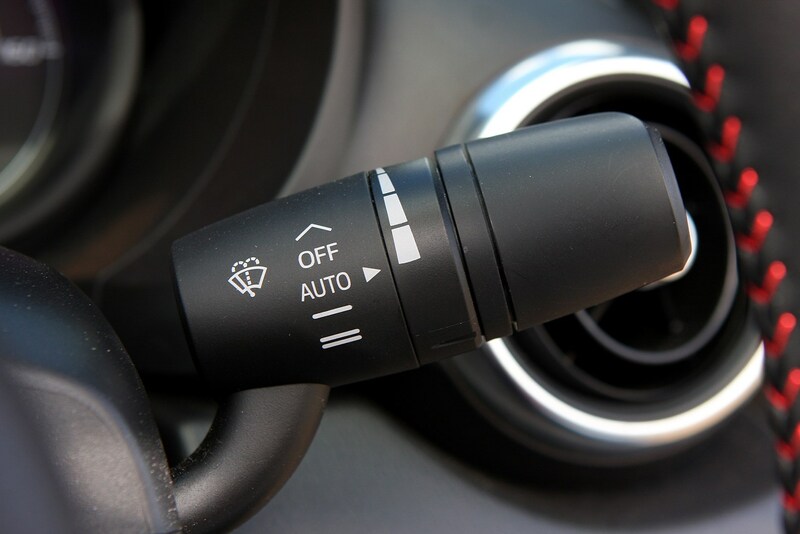 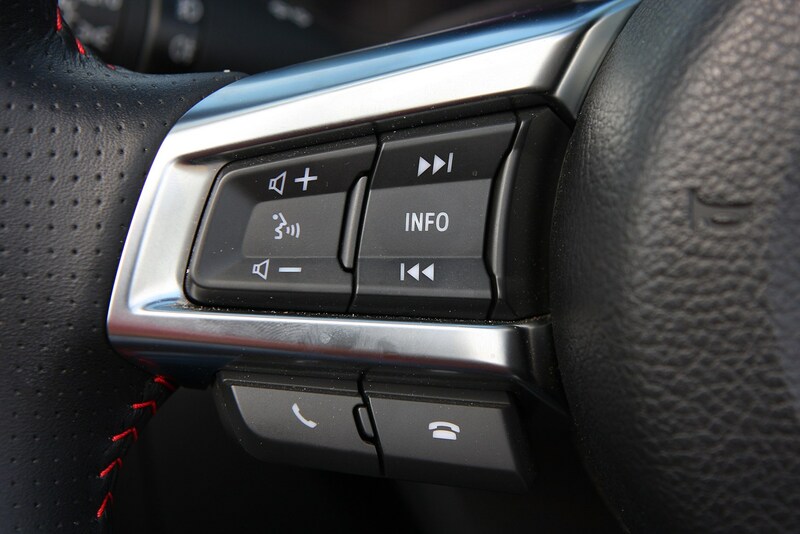 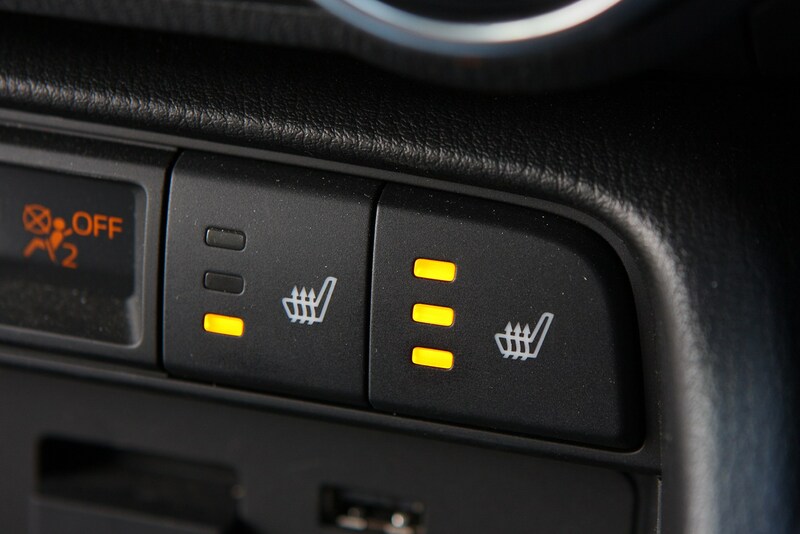 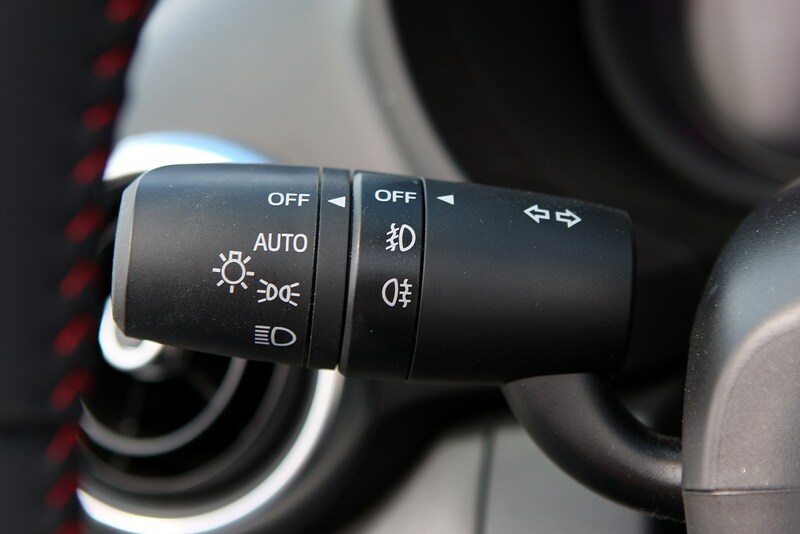 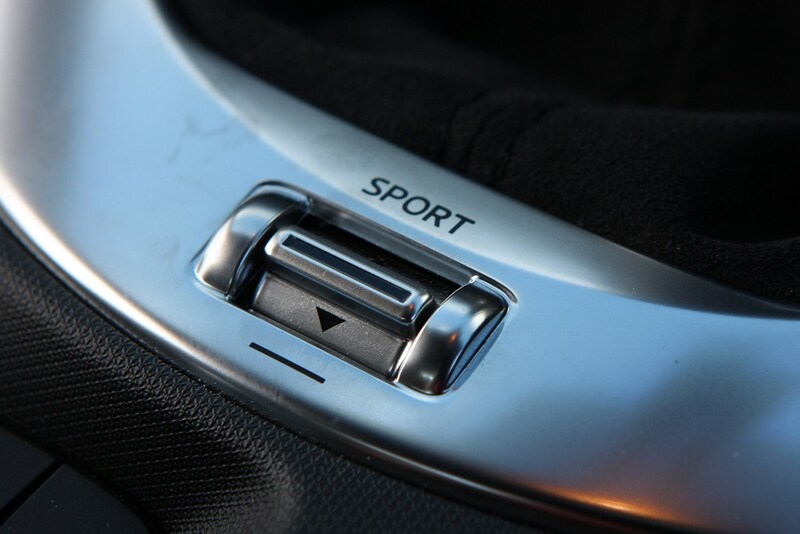 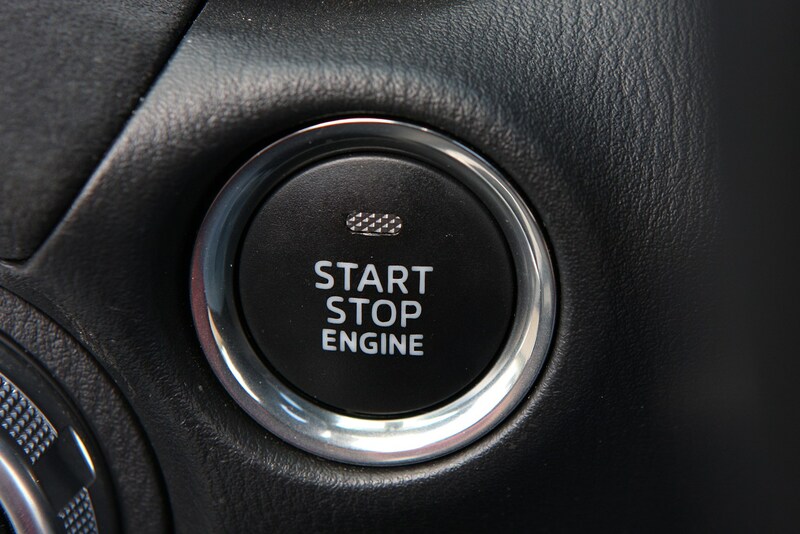 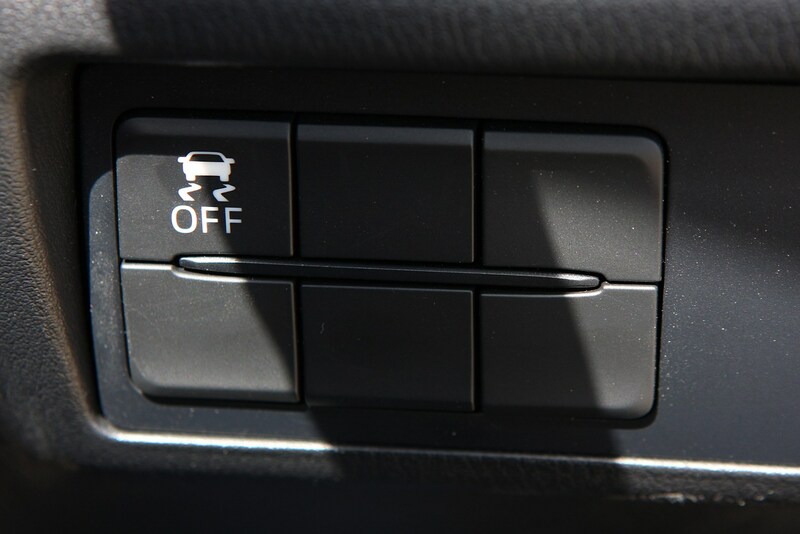 Essentials such as climate control, Bluetooth phone connectivity, heated seats and cruise control are all included. 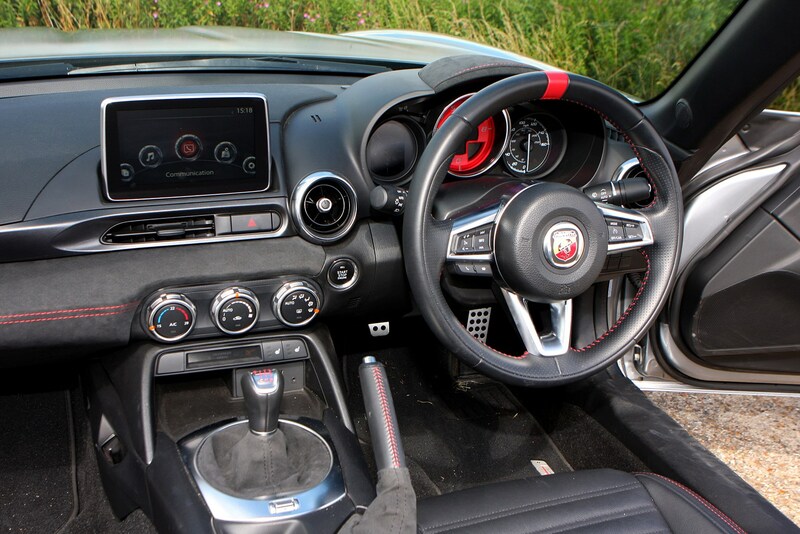 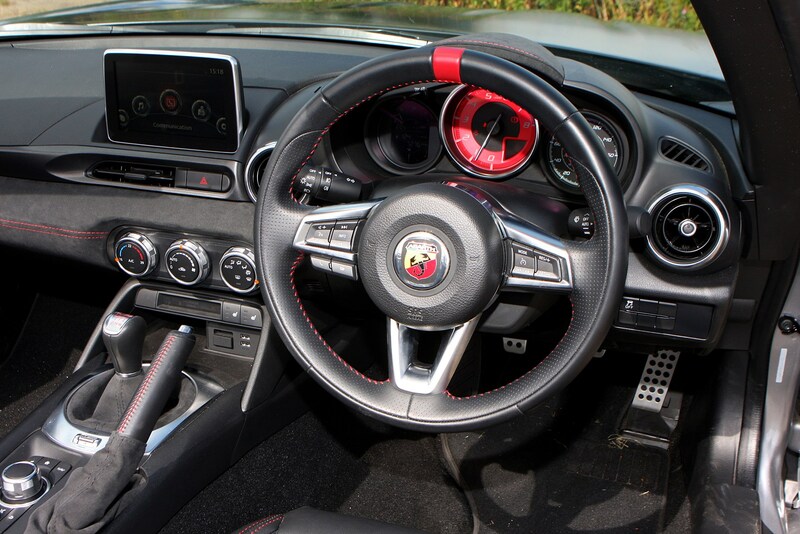 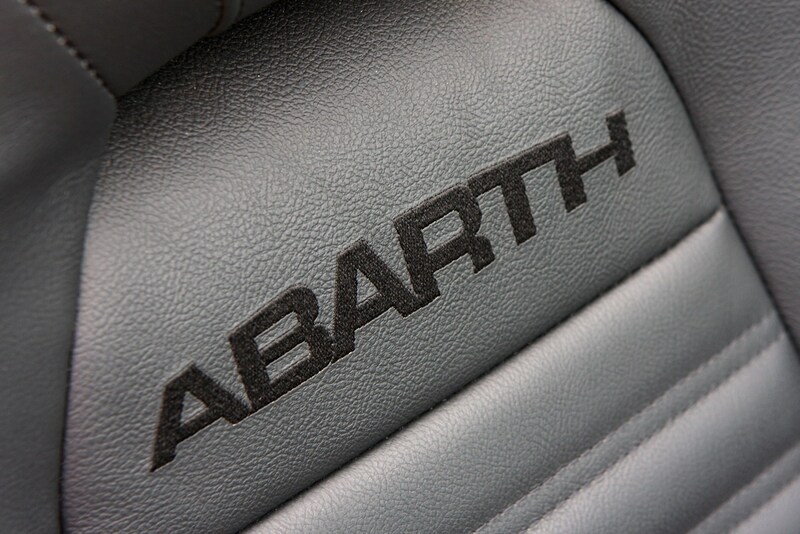 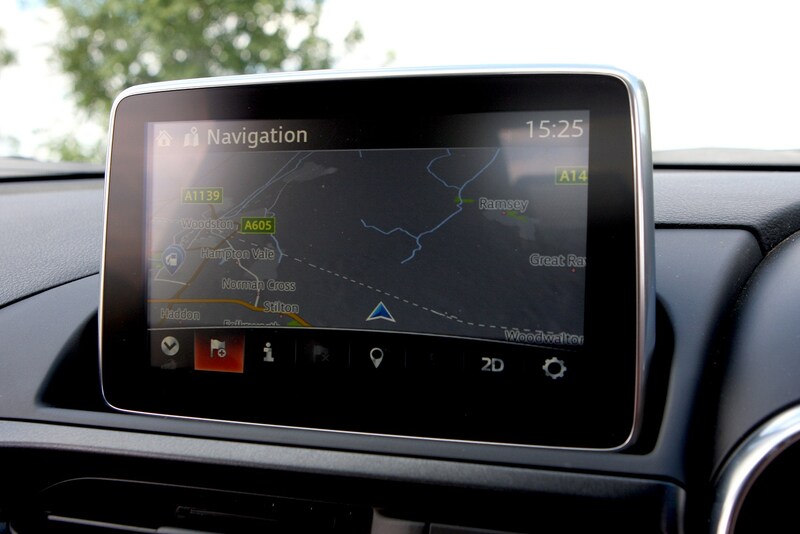 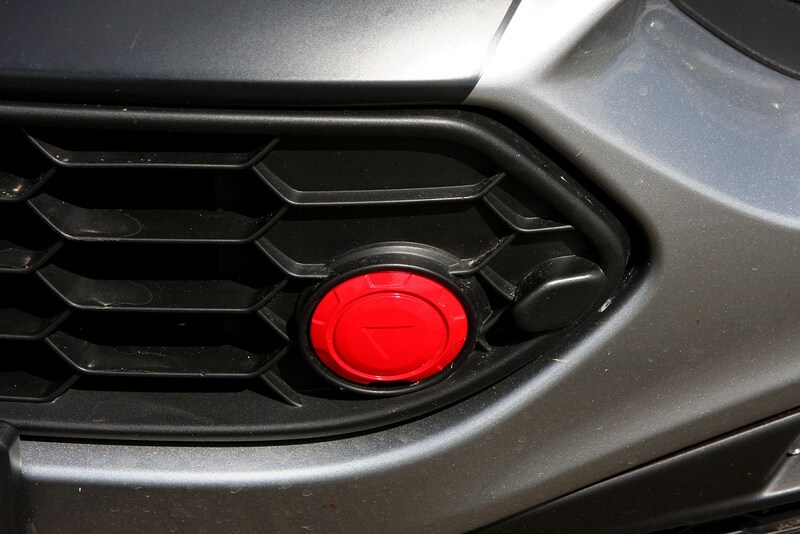 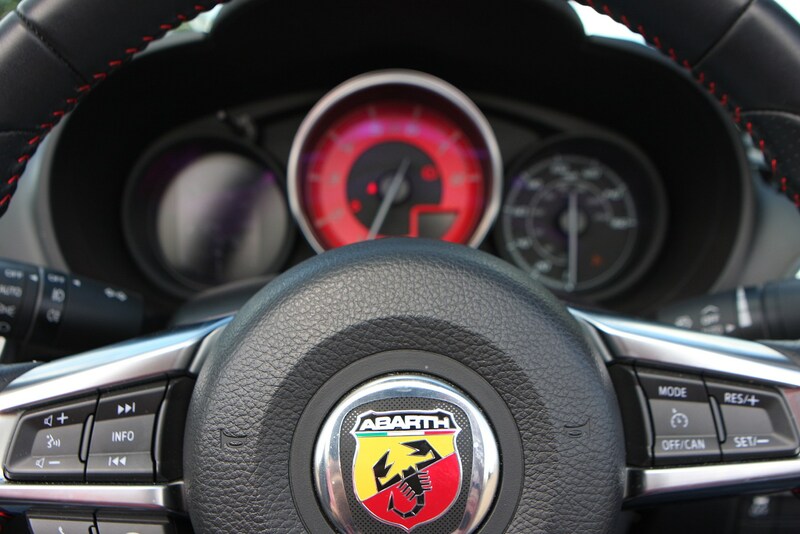 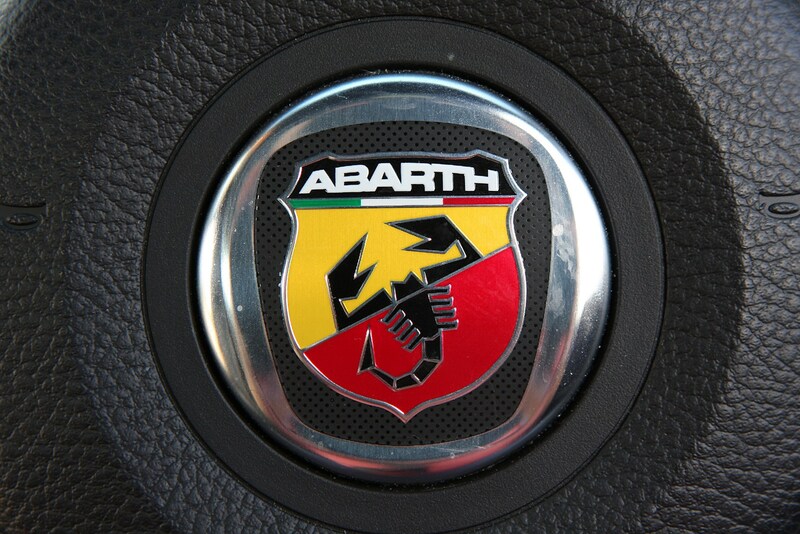 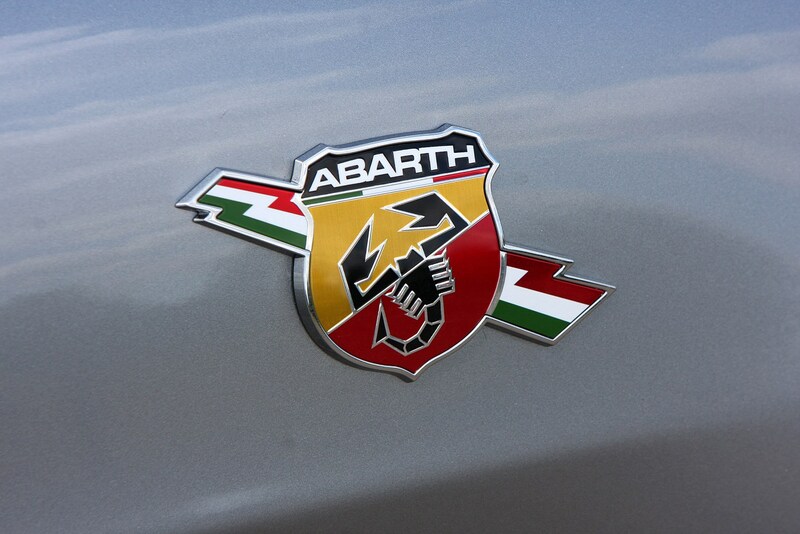 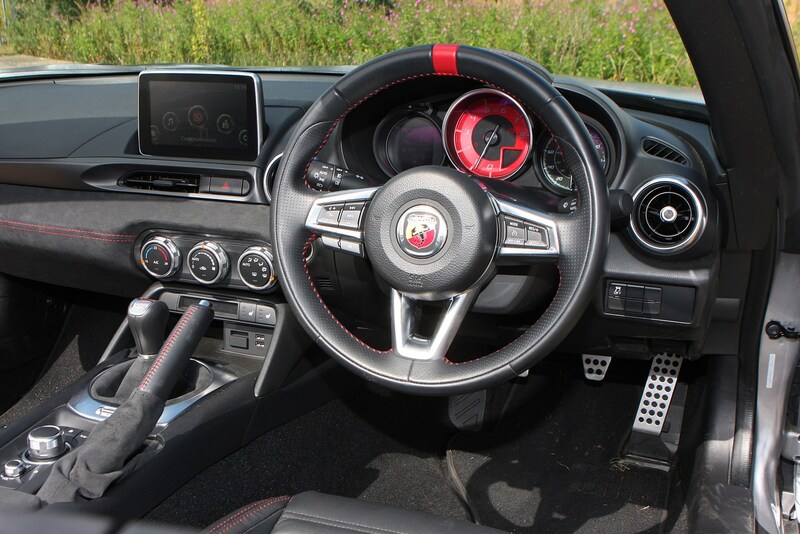 Sadly, there’s no Apple CarPlay or Android Auto connectivity, yet Abarth does offer built-in sat-nav for a small fee. 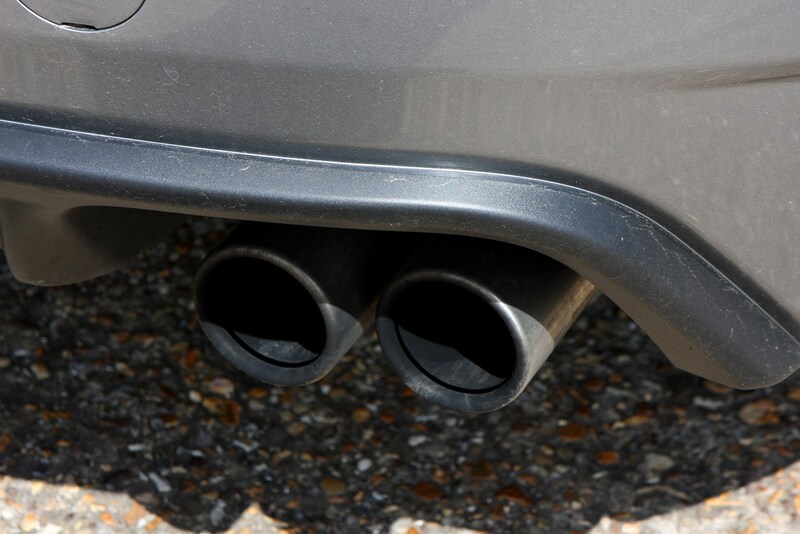 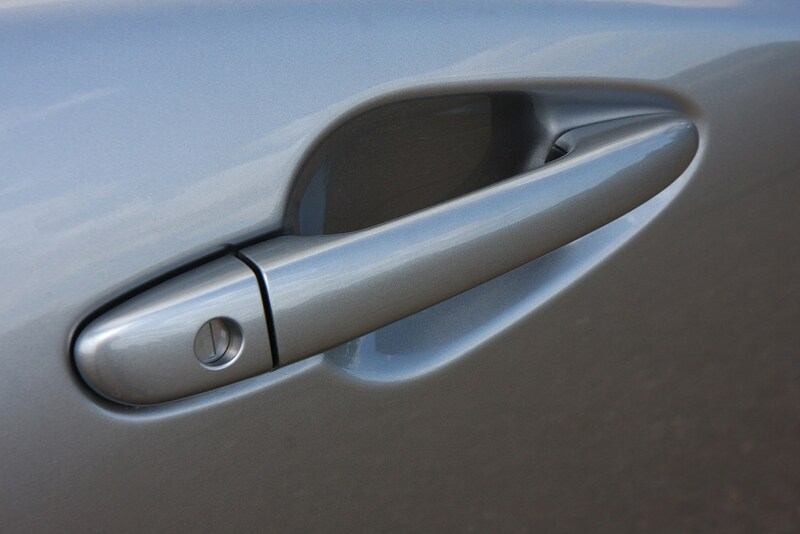 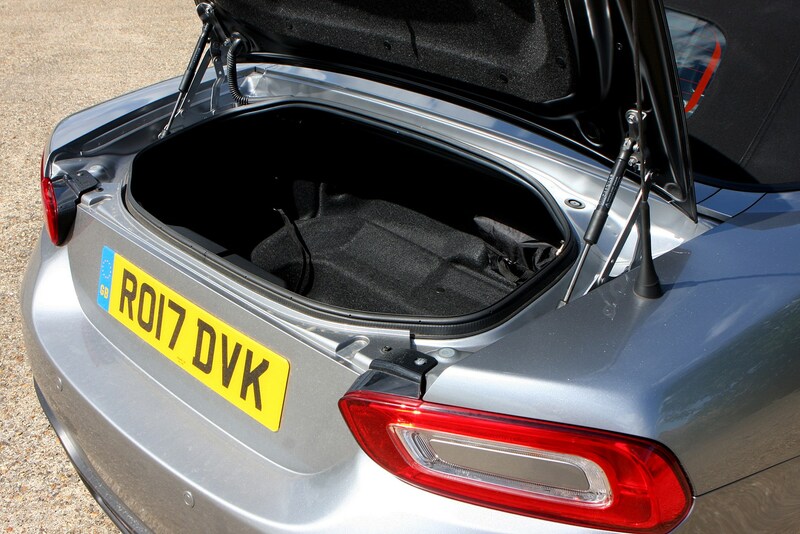 Little practicality – but then what do you expect? 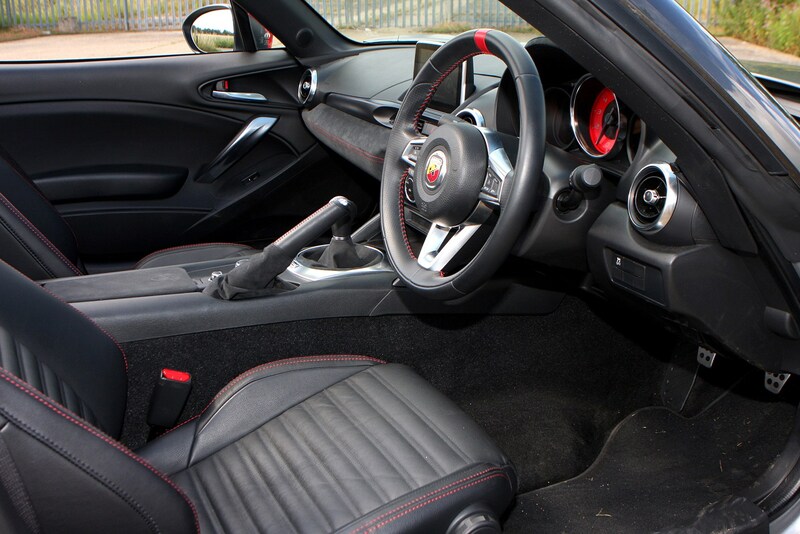 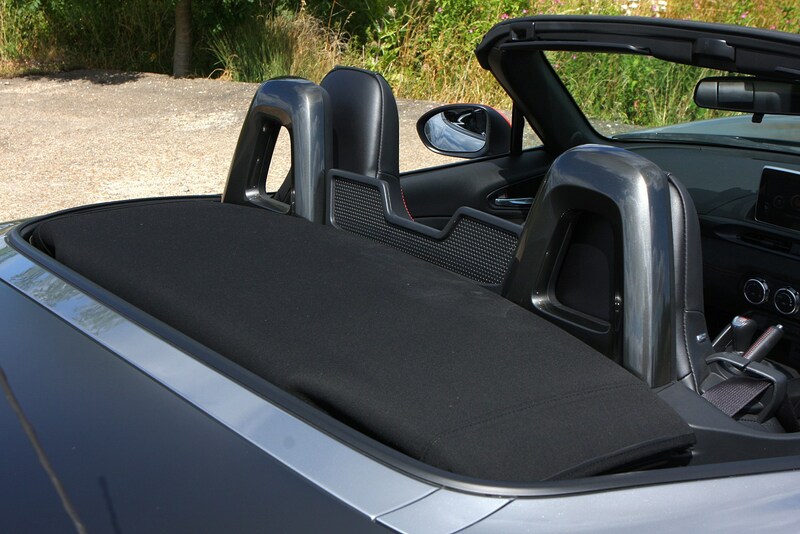 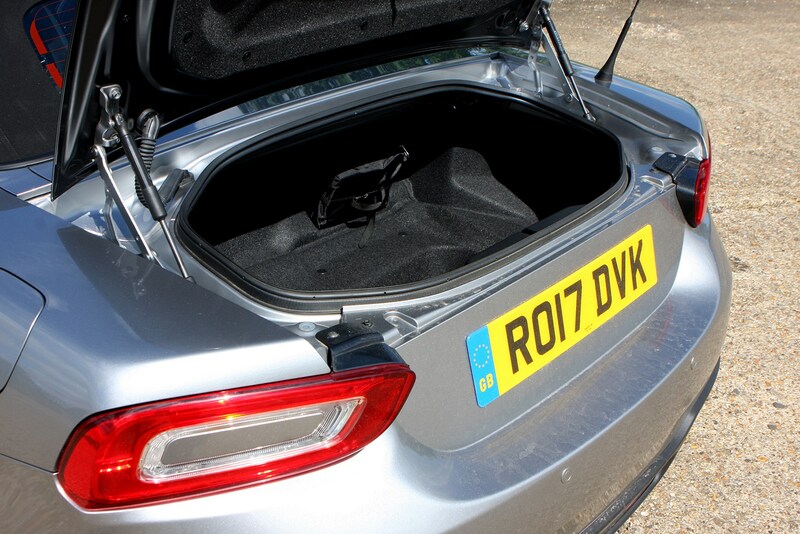 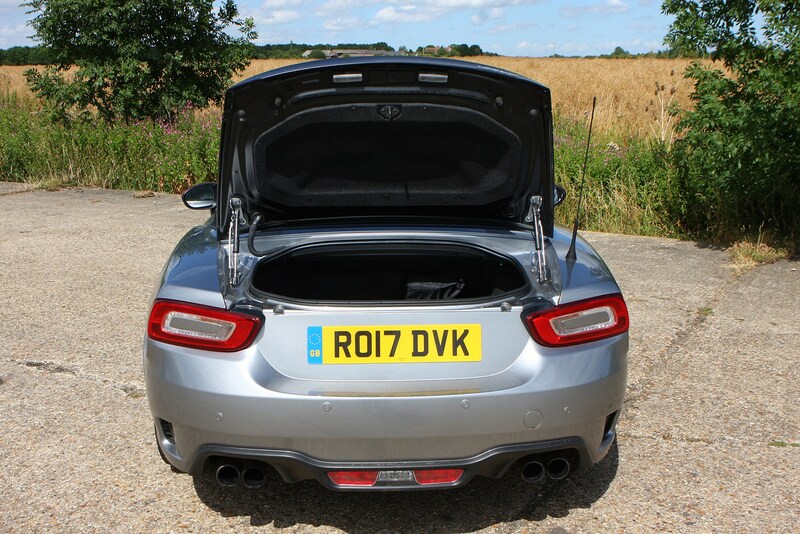 While the boot is capable of swallowing two sizeable soft bags (and absolutely nothing else on top) the interior storage in the Abarth 124 Spider is almost non-existent. 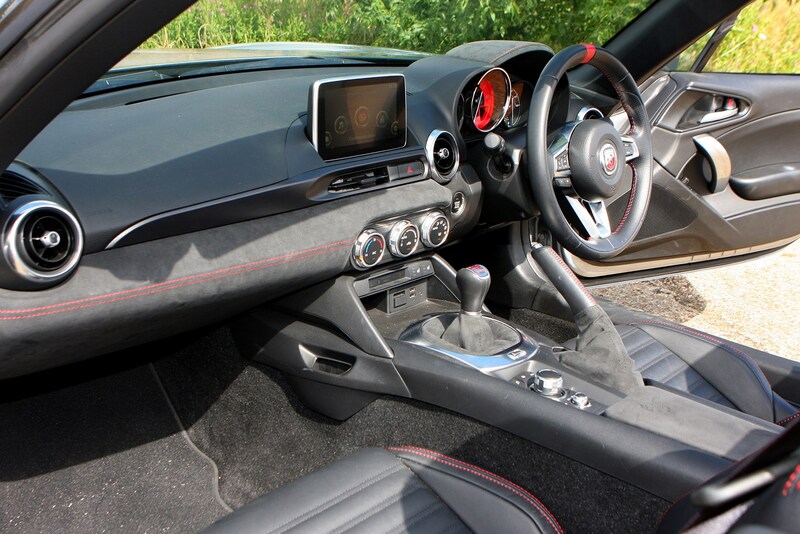 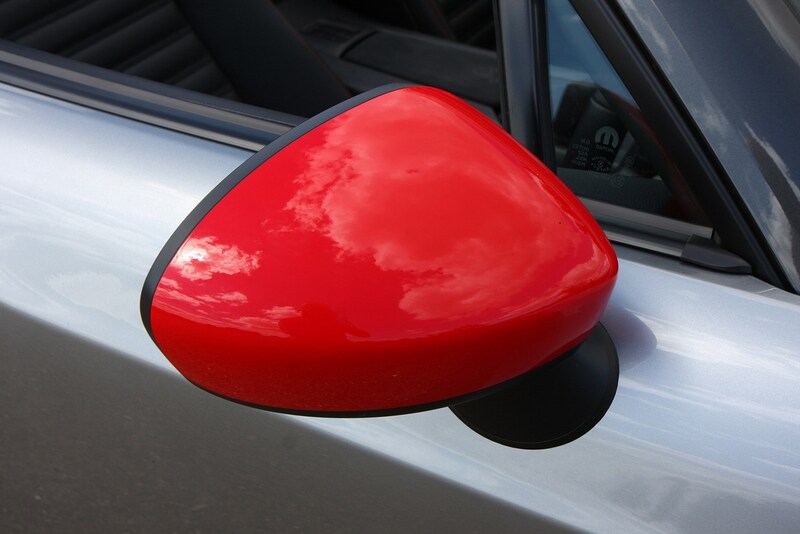 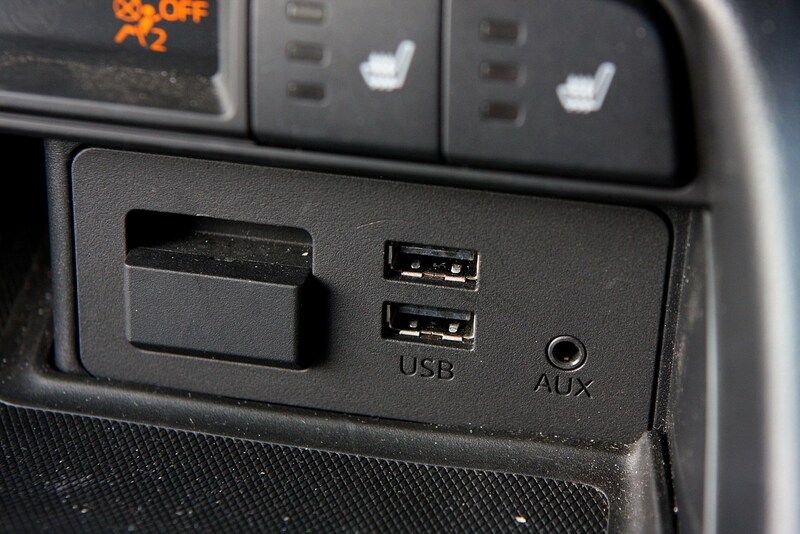 For example, the glovebox has been replaced by a small closable cubbyhole between the driver and passenger, plus there’s nowhere to store your cup of coffee thanks to the lack of cup holders. 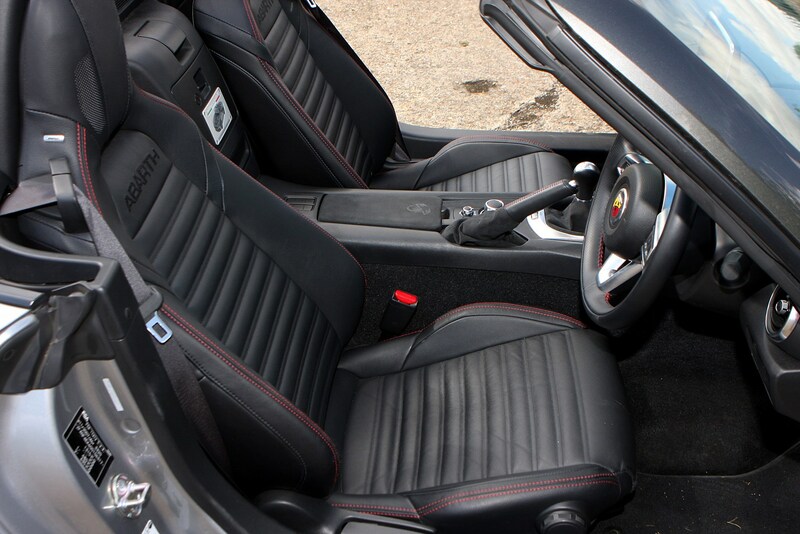 Small water bottles can at least be jammed in between the seat and the door. 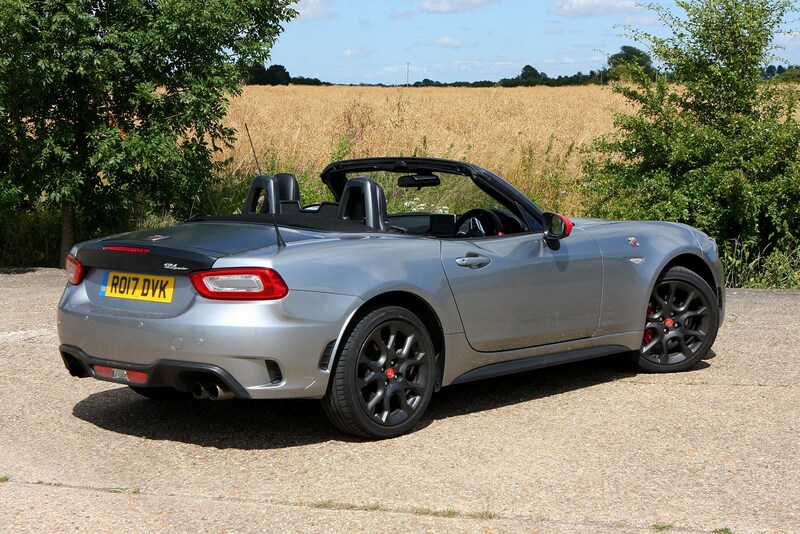 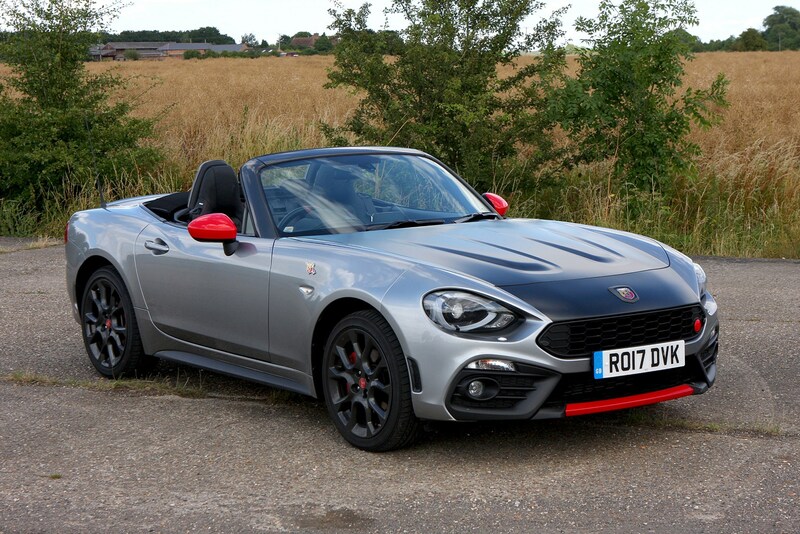 For those who already own a Fiat 124 Spider and enjoy the open-top driving experience, the Abarth performance version may seem like a pointlessly pricier alternative. 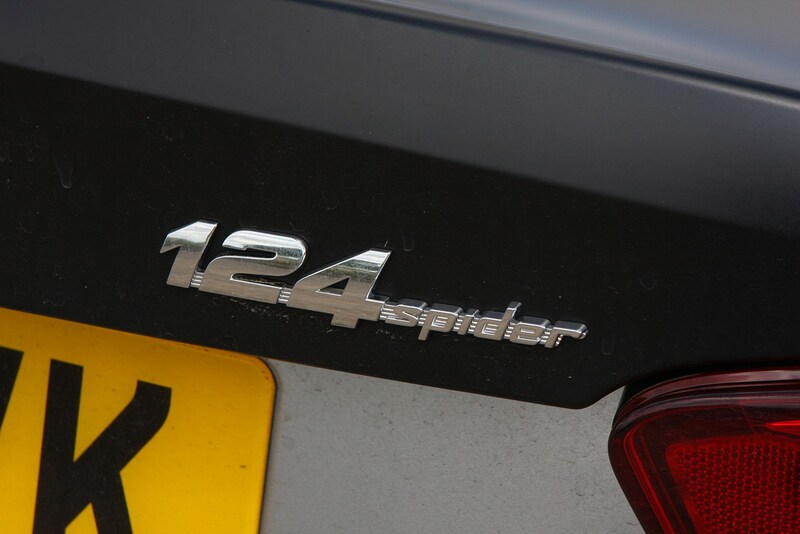 And, to some extent, they have a point. 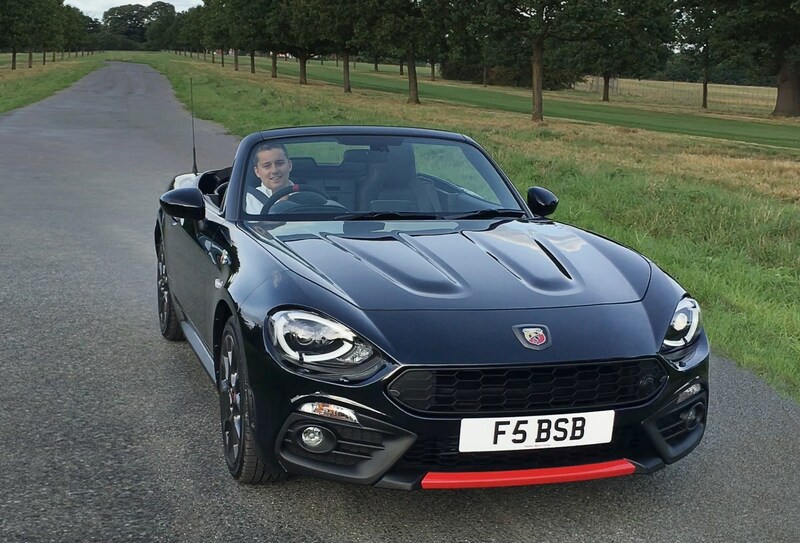 The Abarth, despite its increased price tag, is no better a two-seat convertible than the Fiat 124 Spider. 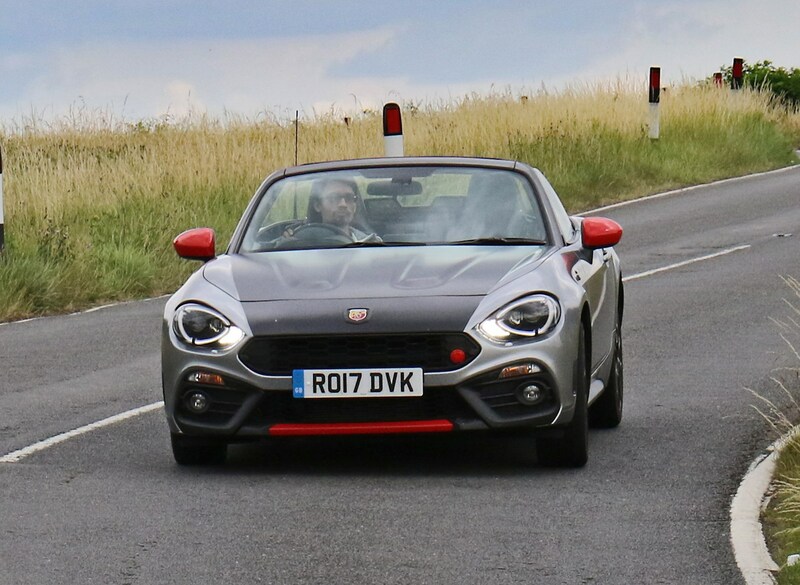 However, for those who value an added sense of drama (both visually and from behind the wheel) and driver enjoyment, the Abarth 124 Spider is worth the extra cash. 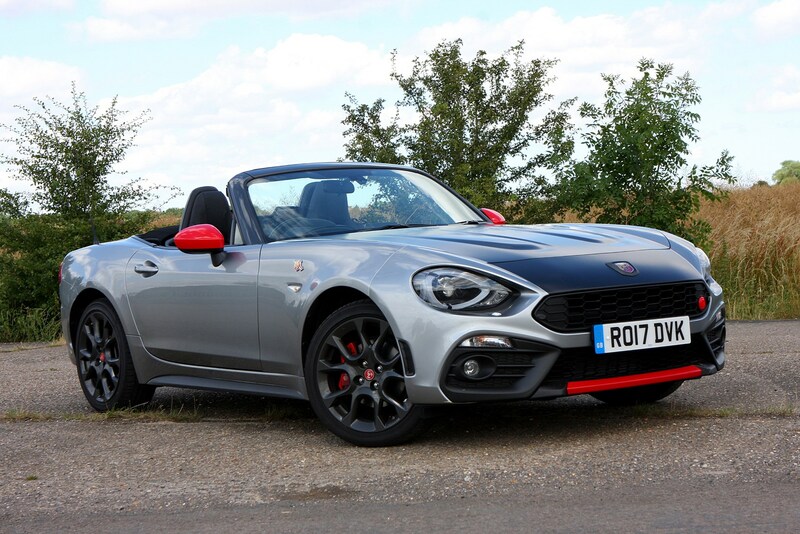 It feels noticeably sportier than its Fiat sibling, and is seriously good fun to take for a nice drive down a twisty country lane. 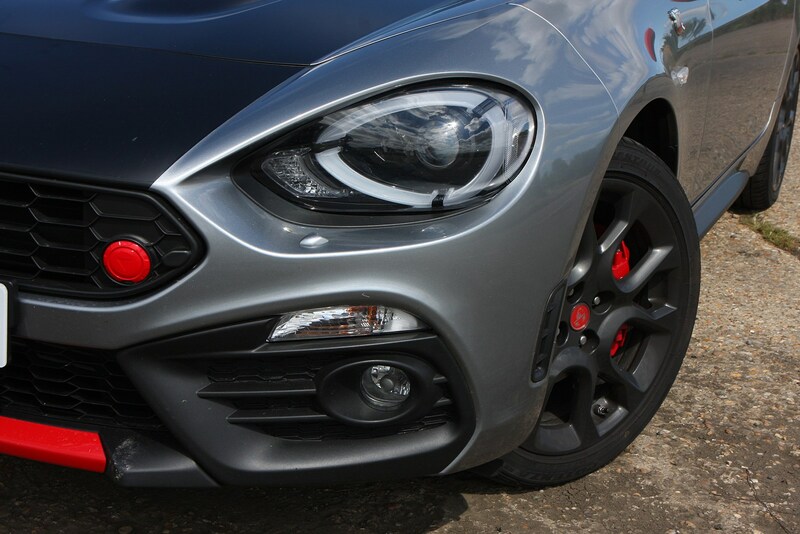 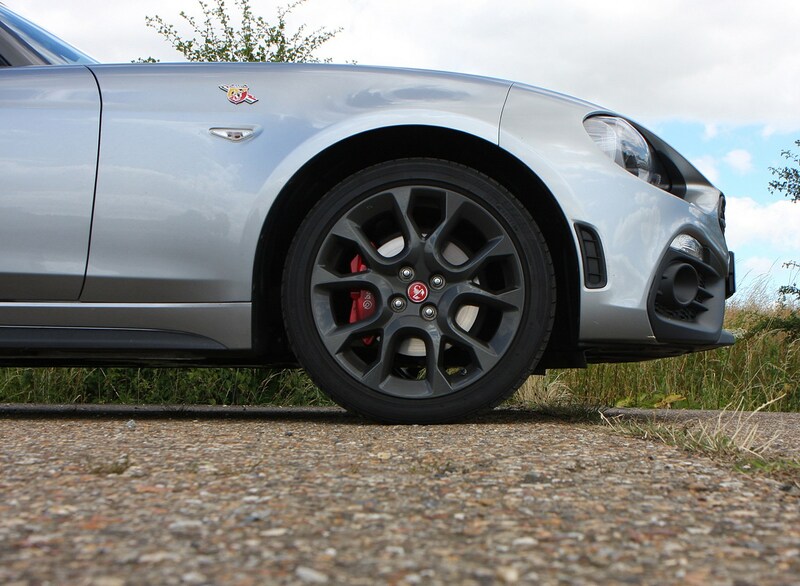 And, the best bit is that once you’ve got over the higher price, the Abarth is just as usable as the Fiat. 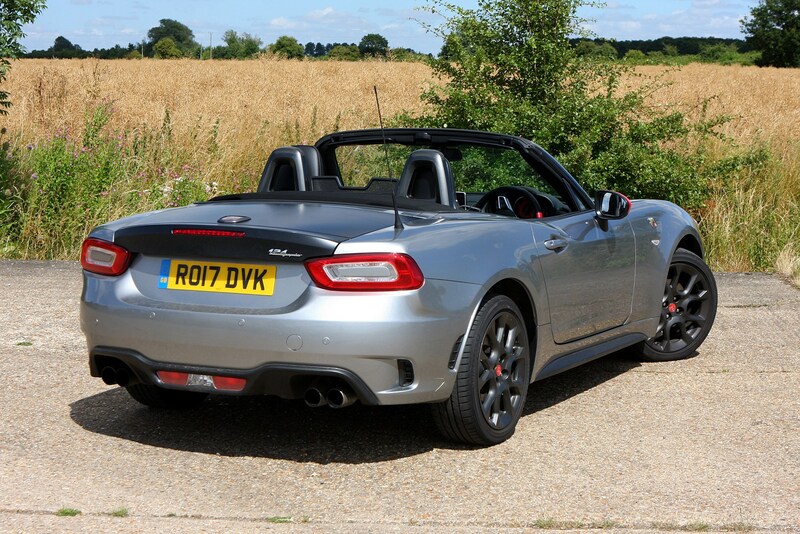 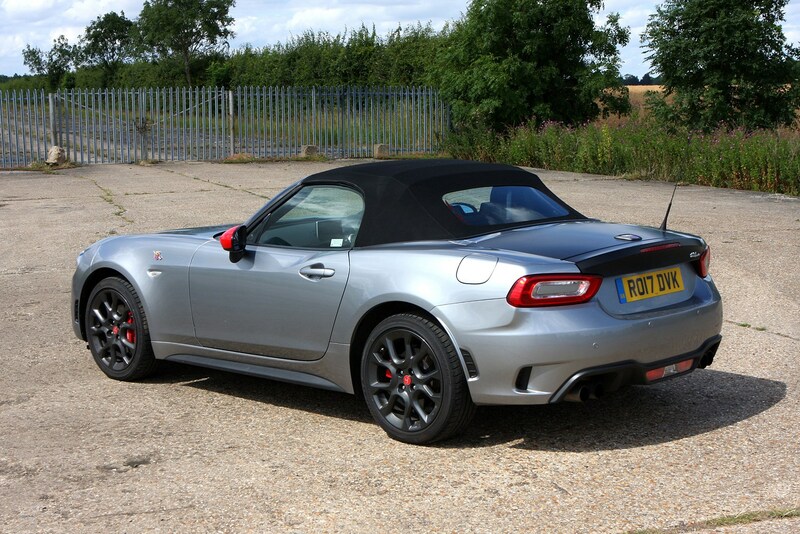 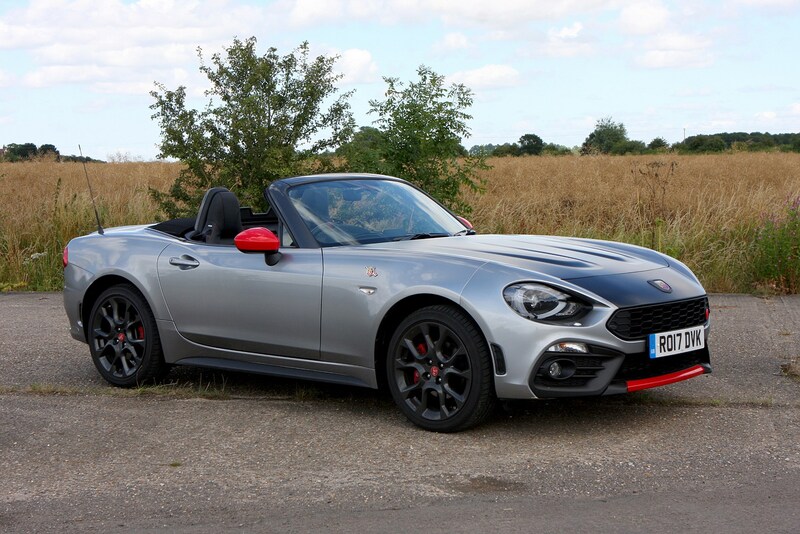 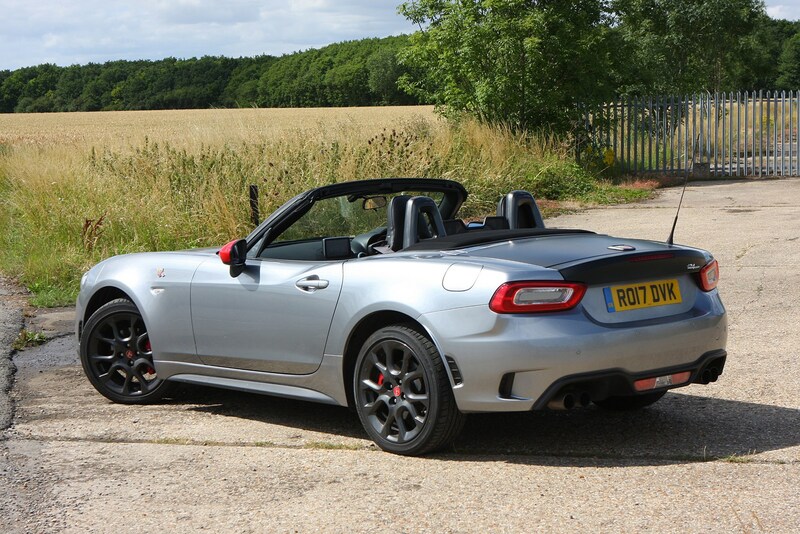 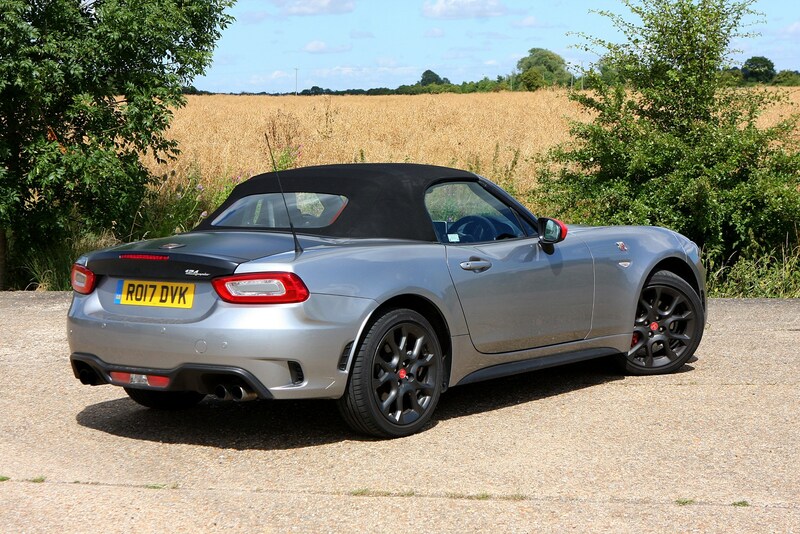 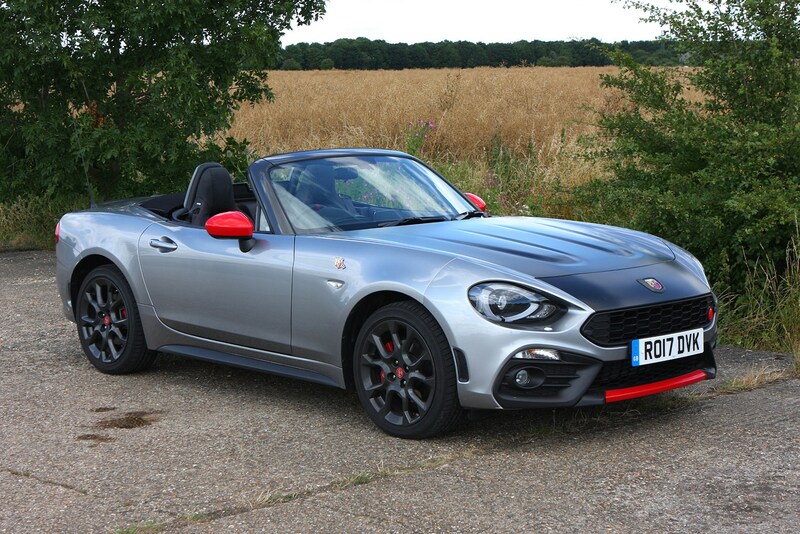 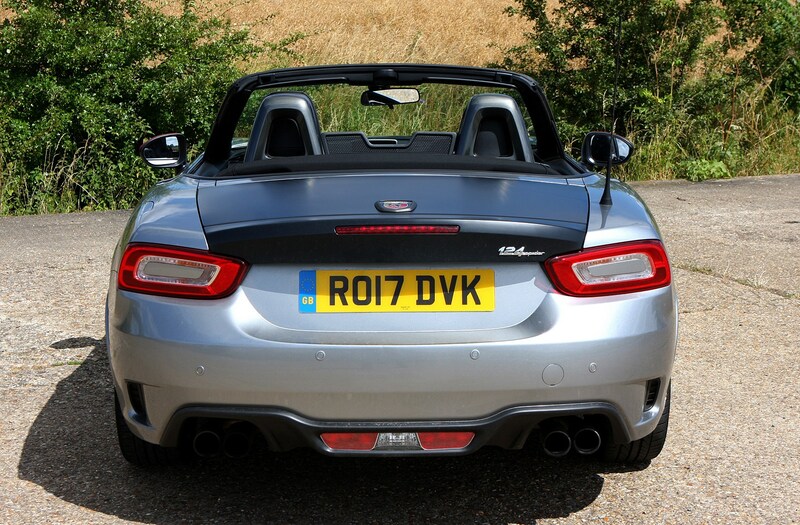 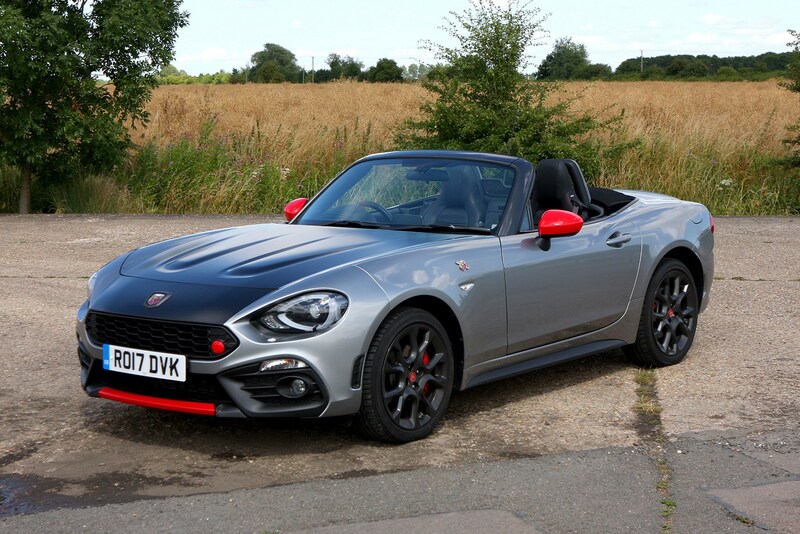 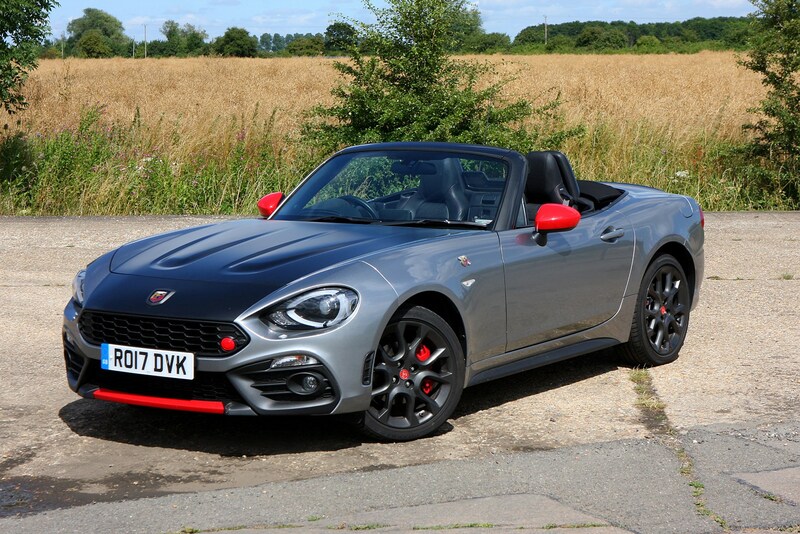 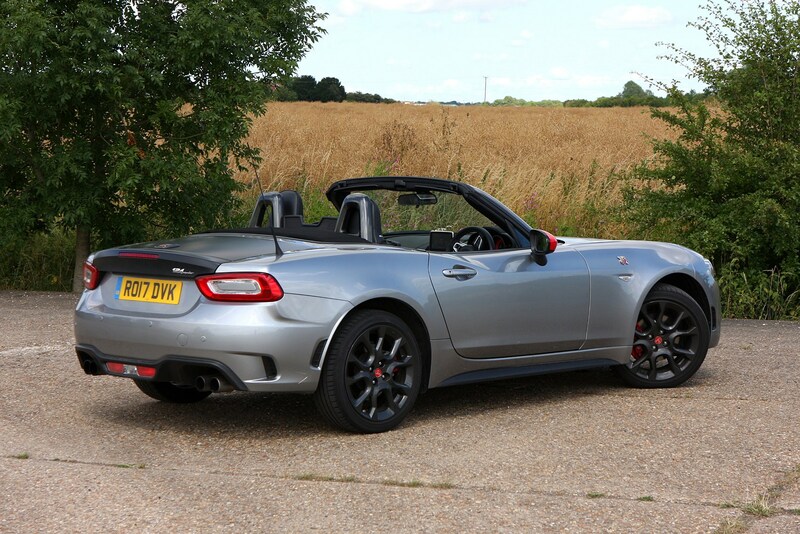 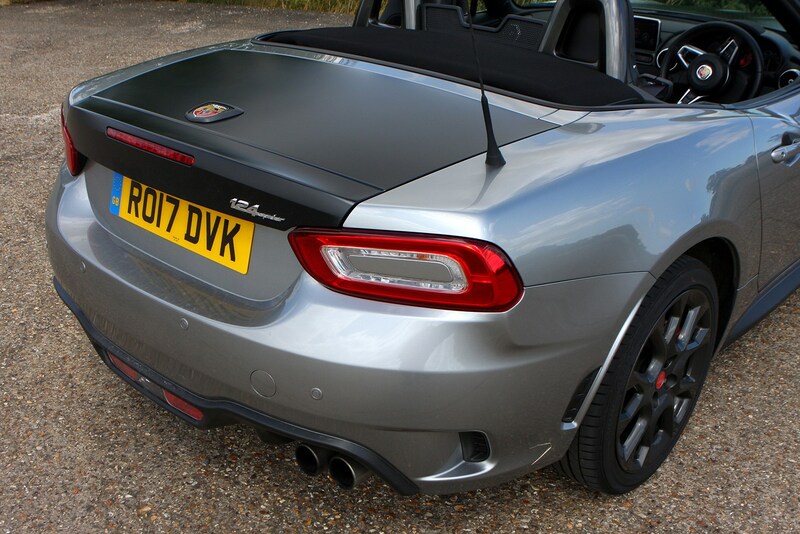 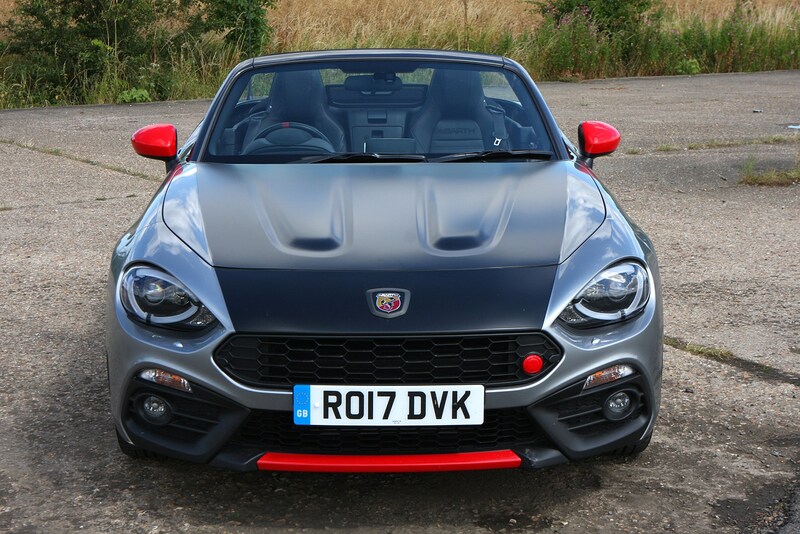 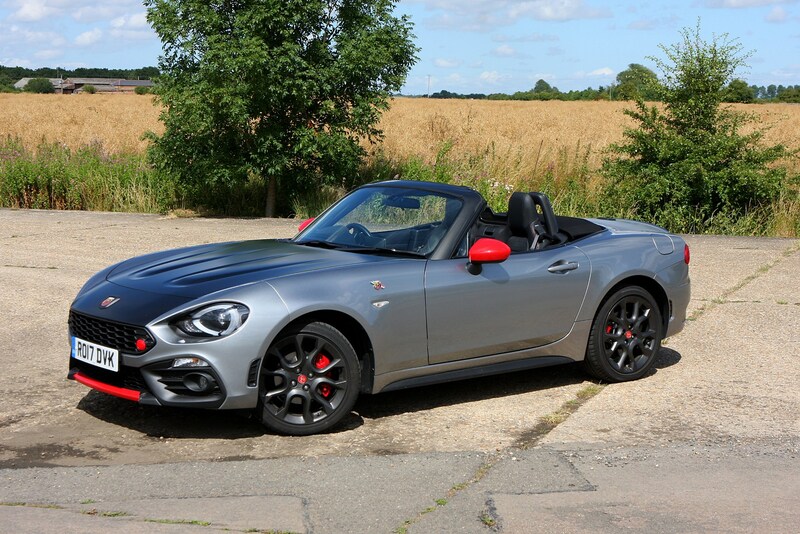 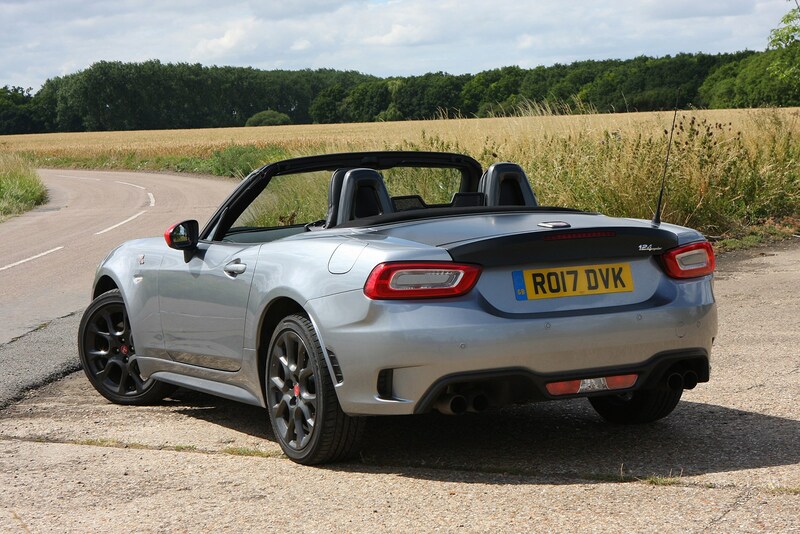 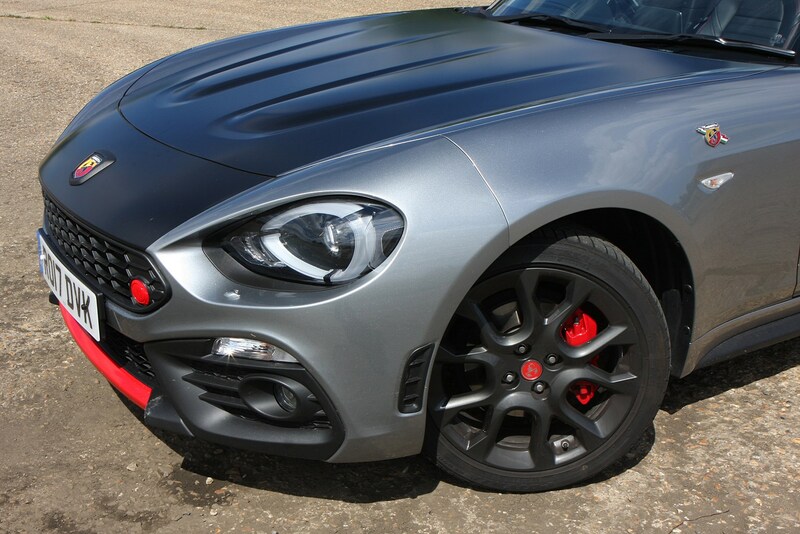 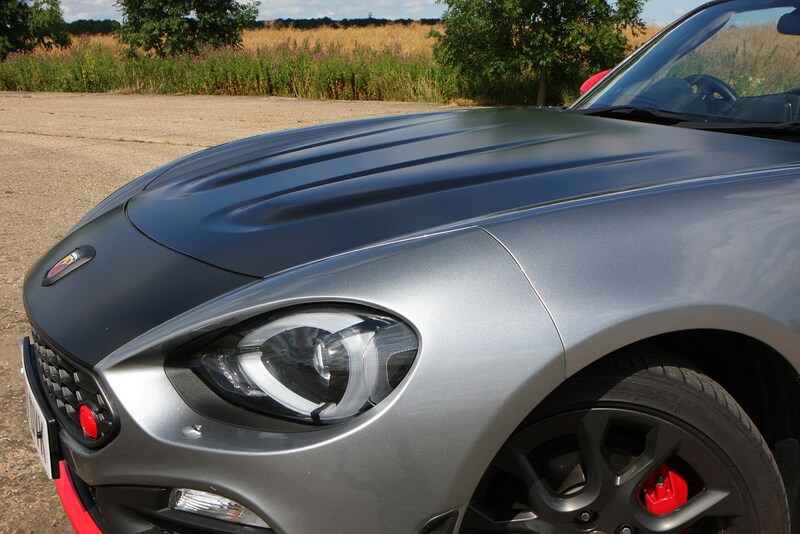 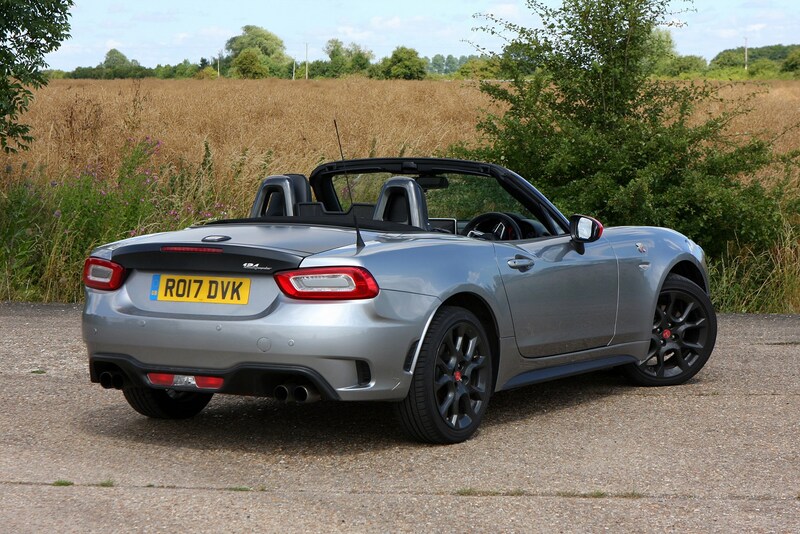 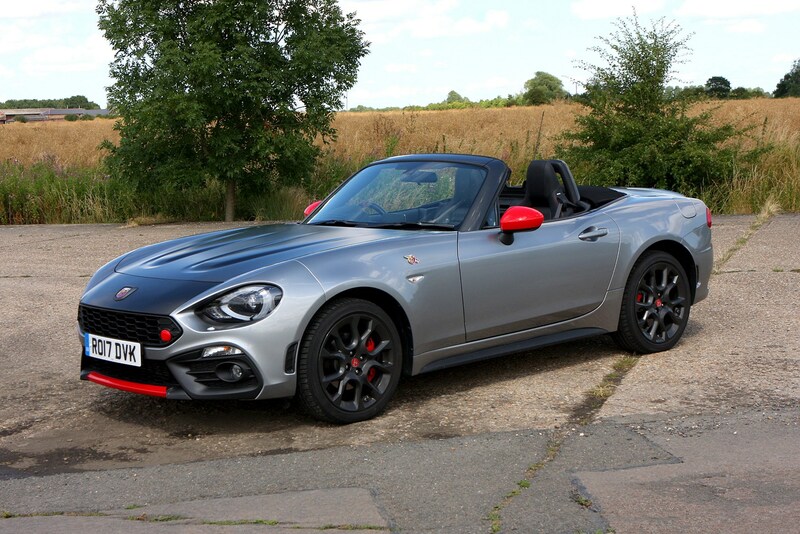 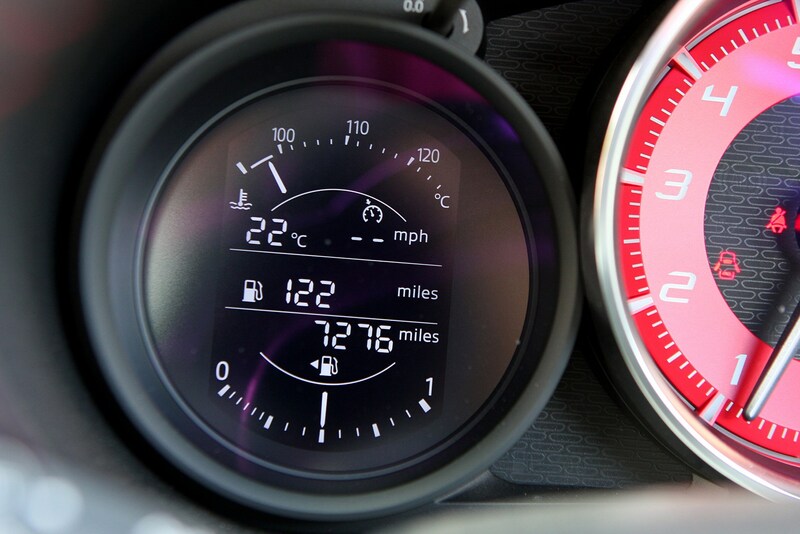 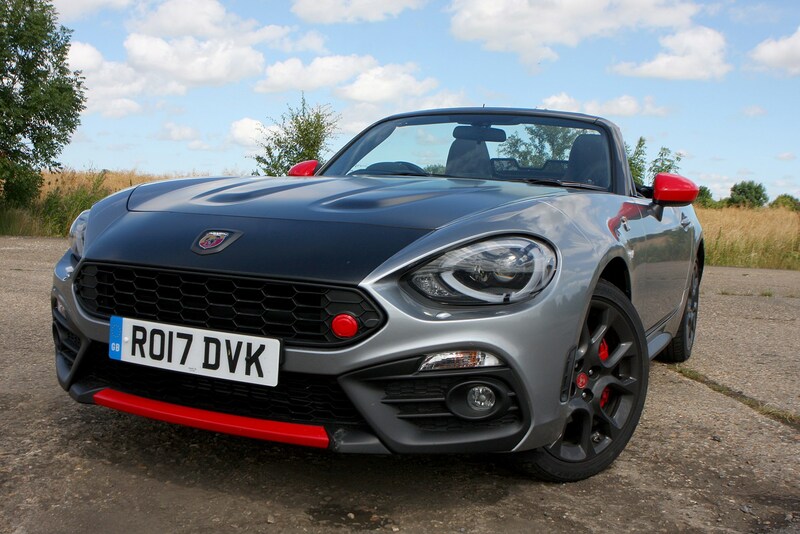 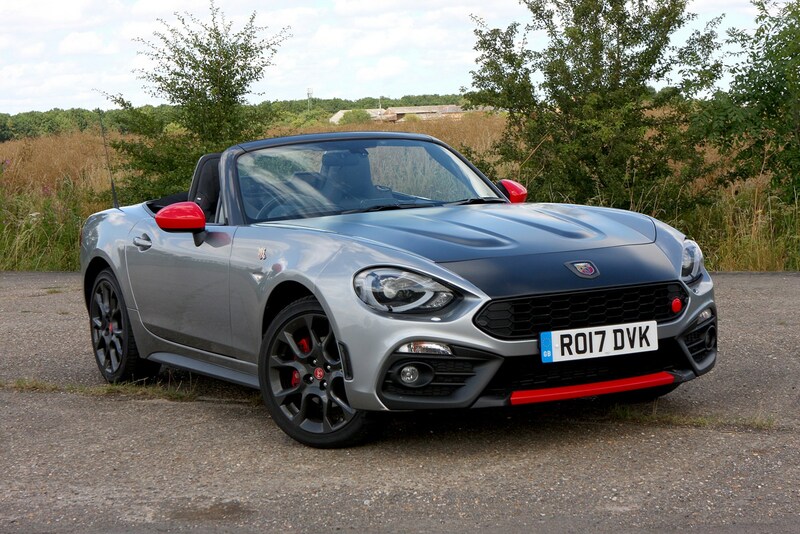 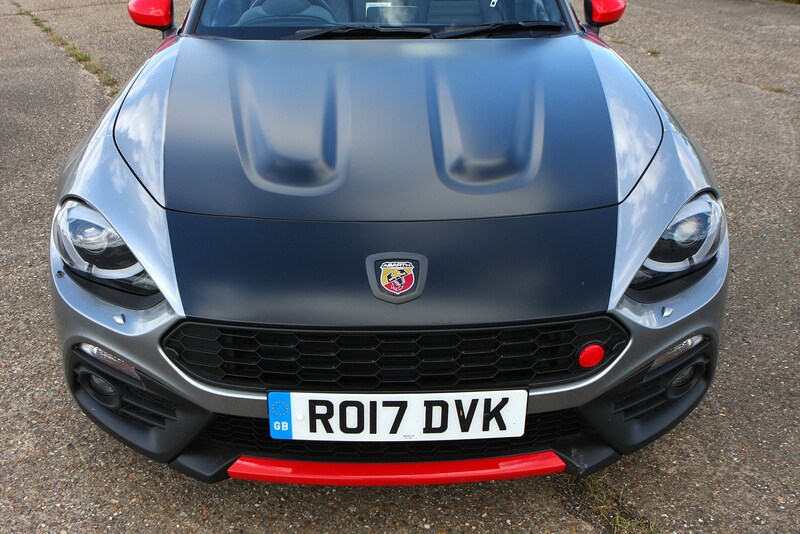 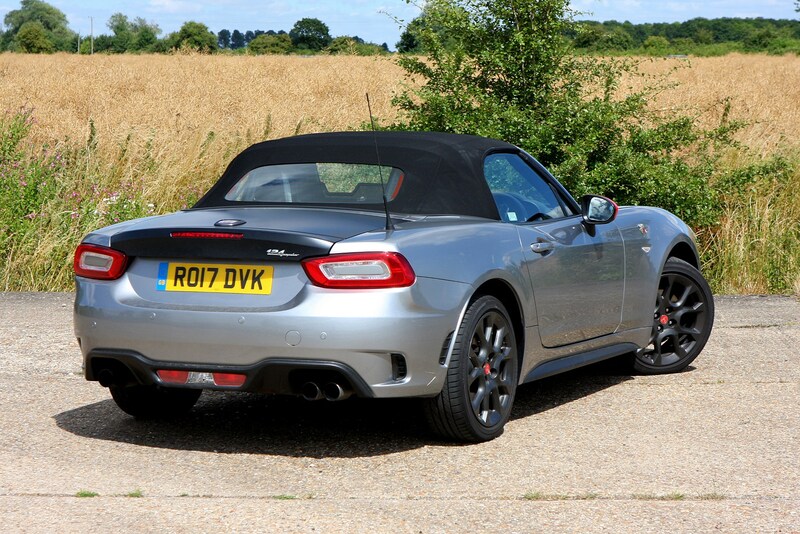 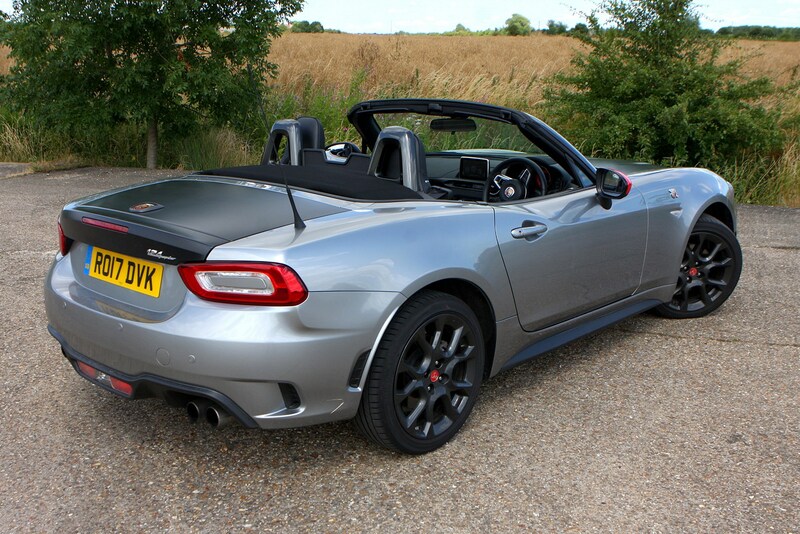 Read on for the full Parkers review of the Abarth 124 Spider.